I have a bunch of raw undyed white fleece that I have spun into yarn and I have decided I want to speckle dye my handspun. I my first try was a total flop. I was going for neon rainbow speckles and first off I ended up with a kelly green, that brought down the entire neon rainbow feel… but also I had no speckles whatsoever! I had followed someone’s YouTube tutorial using plastic wrap in the microwave. Ultimately, I had ruined any chance of speckles from the plastic wrap touching everything and the steam inside the plastic wrap was too much… making water drip, which spread the color everywhere. There is a technique and know how to get a good speckle yarn. 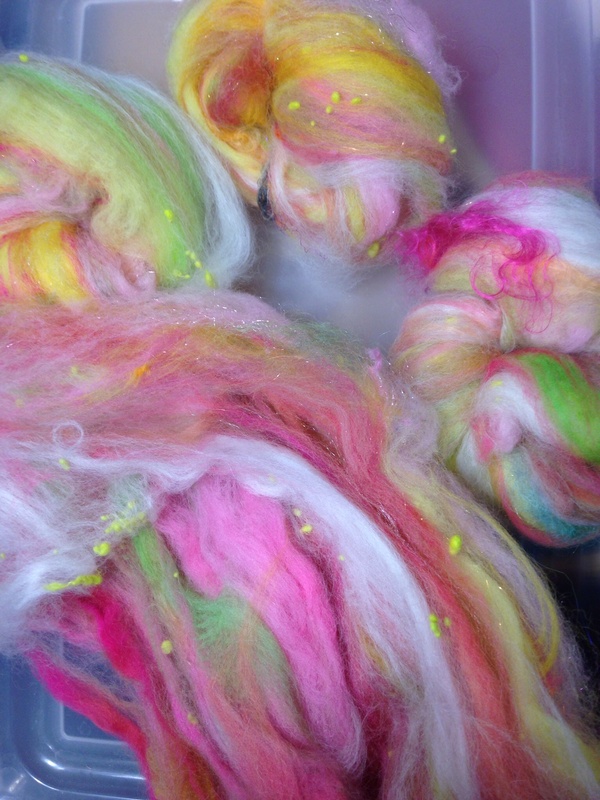 And the dyers who make gorgeous speckles where the dark colors are sharp contrast and where the extra dye isn’t dyeing the bright or lighter colors in the rinsing. It’s hideous!! lol It’s so bad, it’s embarrassing. One good thing about failing so miserably? I have wins in my future. I learn something every time. 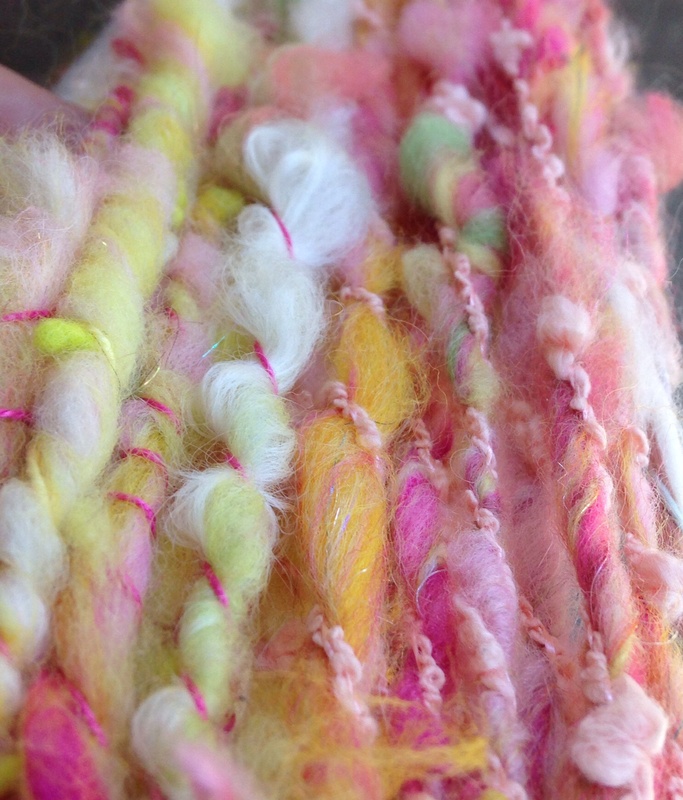 I was not happy with the failed speckle handspun… it even fails as variegated yarn, IMO . 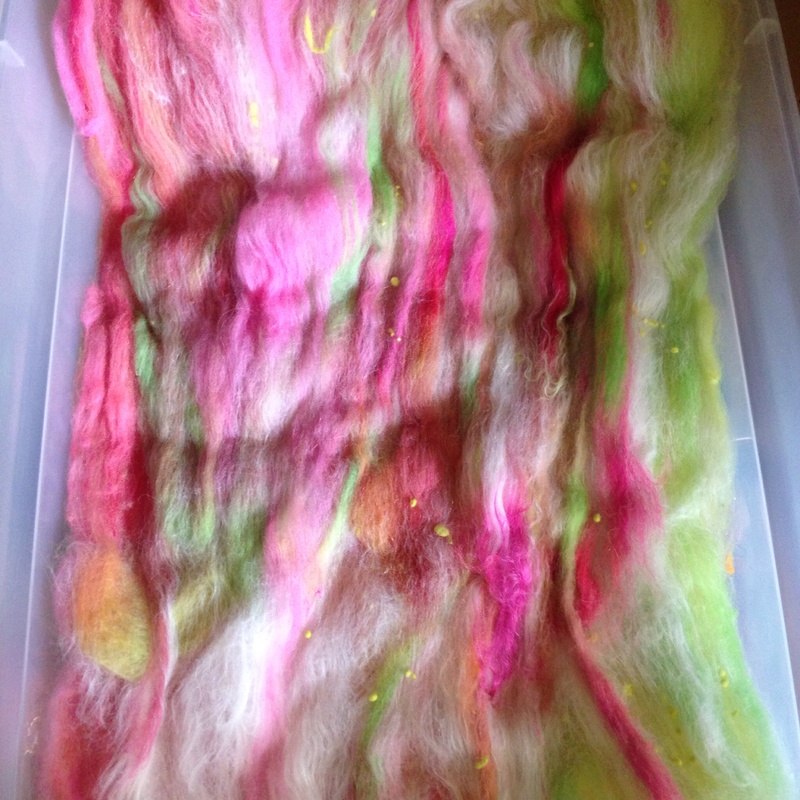 I would not be moving forward with my speckle dyeing on yarn I had processed from raw fleece. I went to my local big box craft store, with 40% coupon in hand, to buy white basic wool/nylon yarn. Fortunately, I have friends who are patient teachers, as well as, amazing dyers, to help me work through my speckle issues. In the meantime, I made some squares for the long term project I’ve got going. Anyone is welcome to join the group and play along. More on that in a later post. I am very very pleased to report, I have been much more successful in my speckle dyeing since this first attempt… thanks to help from those with with knowledge and experience in these things..
No plastic Saran wrap or microwave involved. These were my next few attempts. I did dye some solid neon minis. These just make me happy. I made this video to show how I spin locks and leave dangling curls with my small kiwi orifice and 4ounce bobbin. Before I had any wheels that had the specs for more bulky and textured yarns, I really wanted to try spinning locks and having the curls dangle. I wanted tailspun. While I couldn’t have a yarn any thicker than my orifice, I made it work with thin yarns. I spun it just like I would spin a traditional yarn. I didn’t core spin or anything fancy. I just spun it the way I knew how like it was a traditional yarn. I did spin much longer locks but lamb locks and thin locks worked the best for my orifice. I made this video to show a friend how I did it and thought I’d share it here..
As far as plying, sometimes I would make two bobbins full and then ply them together for twice the dangley locks, or I’d thread ply but most often I’d leave it as a single, and it was fine as a single. You can see in the video even the smallest orifice can fit this size art yarn. So give it a try. I’m spinning blue faced leister lamb locks. And the orange locks are mohair. I think I was avoiding my oldest work in progress (the daisy square afghan), by way of, starting another project from deep stash. 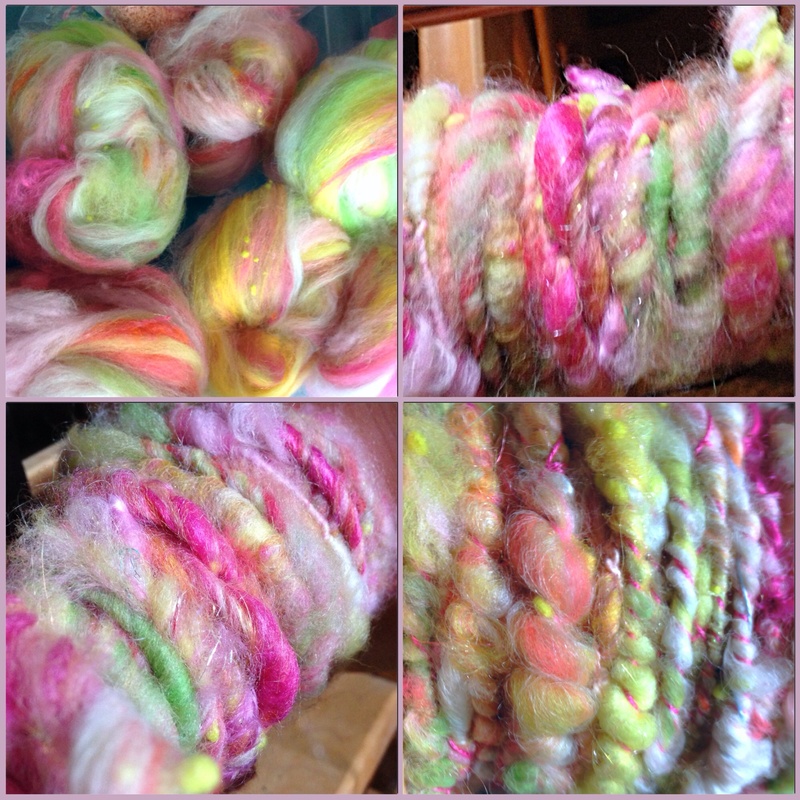 My husband gifted me a drum carder and raw merino fleece the first Xmas after I started spinning. 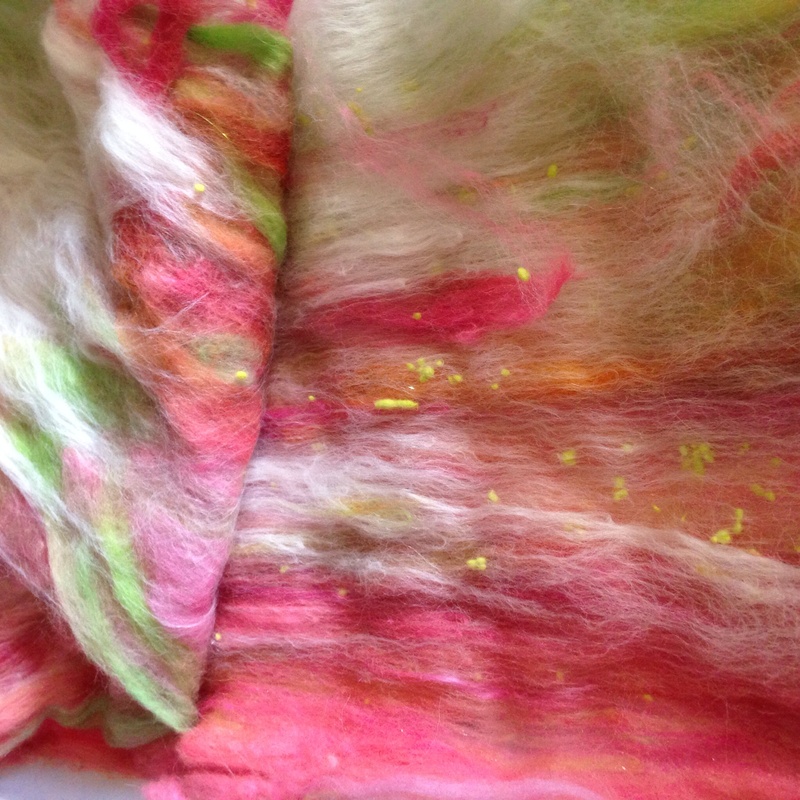 I was only spinning a couple months by this time and had no experience with raw fleece. I was so lucky that I didn’t felt/over scour/ruin the fleece during the washing process. 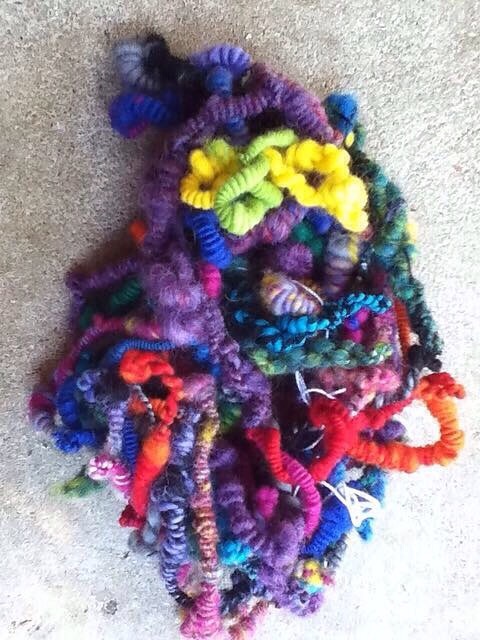 After washing, I tried spinning and koolaid dyeing a few skeins but several pounds went into stash. And there it waited. In my avoidance of the WIPs I already have going (daisy afghan, viajante, socks etc) and should be doing I went to my stash.. just window shopping, really. 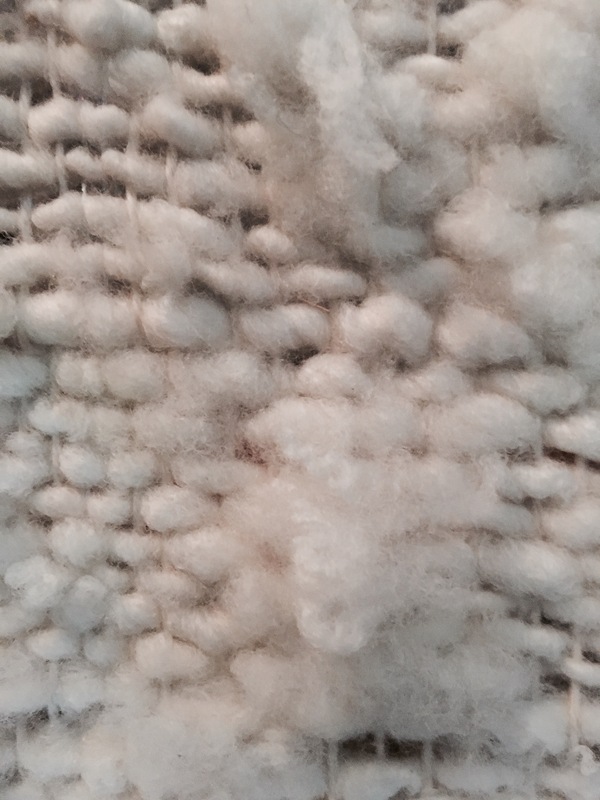 I came across one of several bags of this merino fleece. 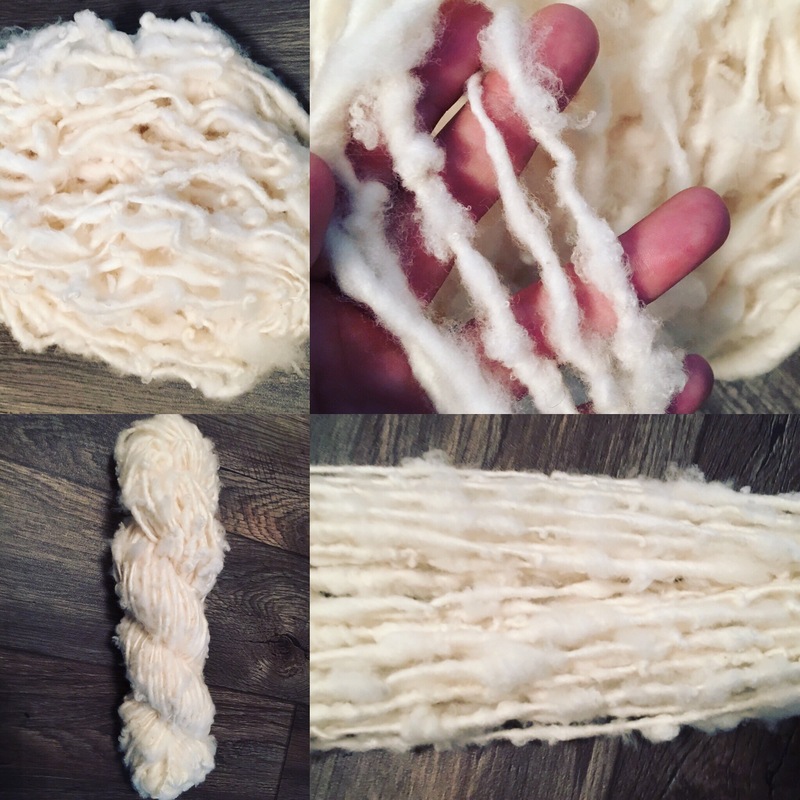 That technique is so cool for long locks but it also works for fine wool. Specifically, magic thumb is able to save lock structure and crimp like no other. 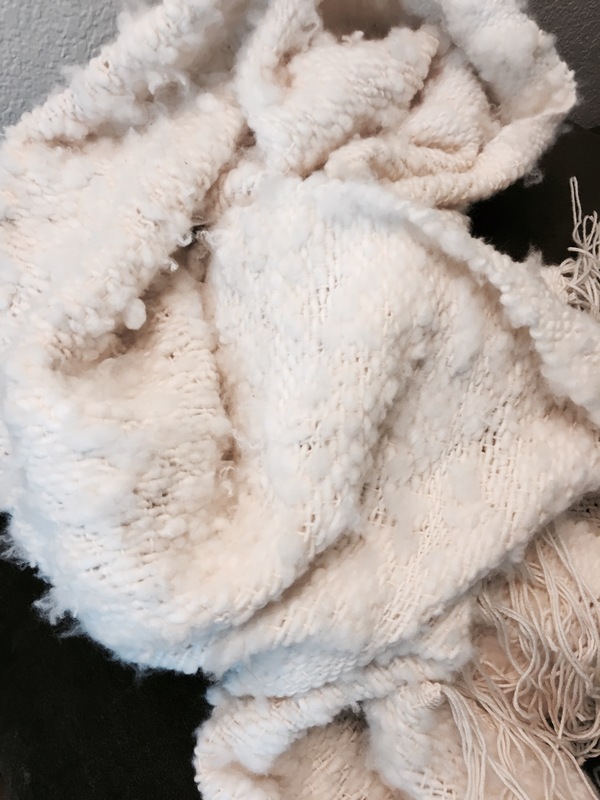 It made this airy woolen coreless corespun. Keeping the crimp throughout the yarn was important to me. It’s those curls I wanted to save in spinning the yarn and hopefully try to keep in a finished project. I would grab a handful of the clean locks, and lightly hand pick and spin magic thumb. I had spun 3 skeins when I thought how awesome a blanket would be. That was the plan when I warped the loom. Hahahaha. That’s too funny! I settled for a shawl since a blanket might take another 20years. 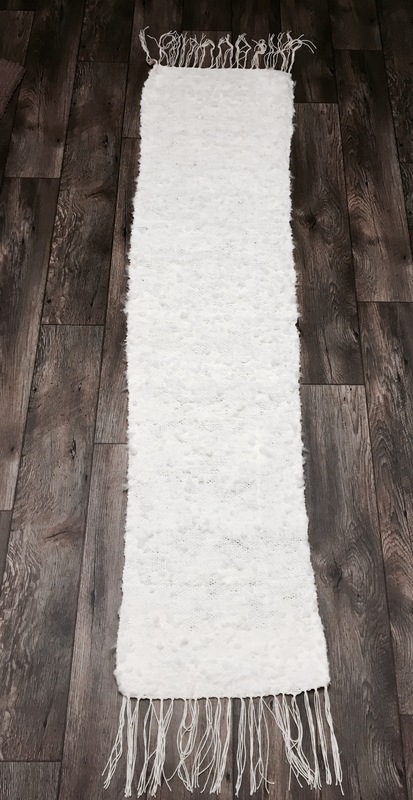 But initially, the grand idea was making several strips that would be whip stitched together for a blanket. 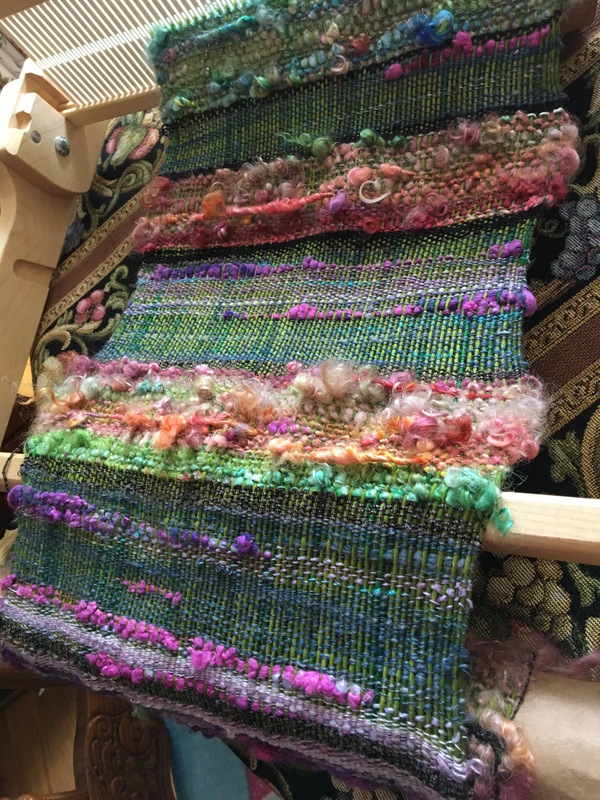 I started spinning the yarn on May 22,2016 and pulled the finished piece from the loom on June 4, 2016. 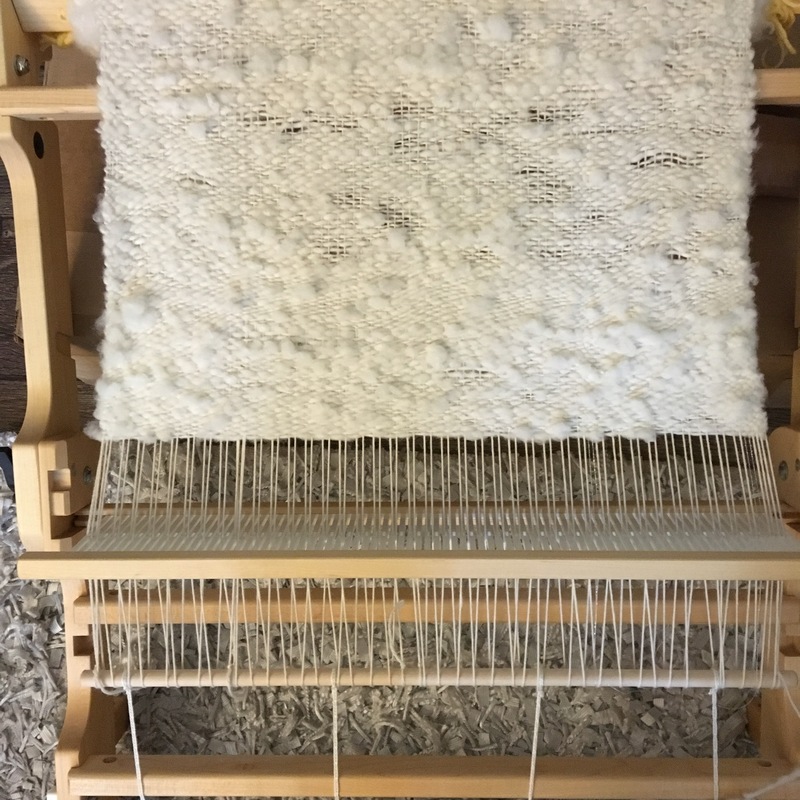 The loom was warped with 2 skeins of a white commercial yarn, made of, 50% alpaca, 25% merino, 25% silk. 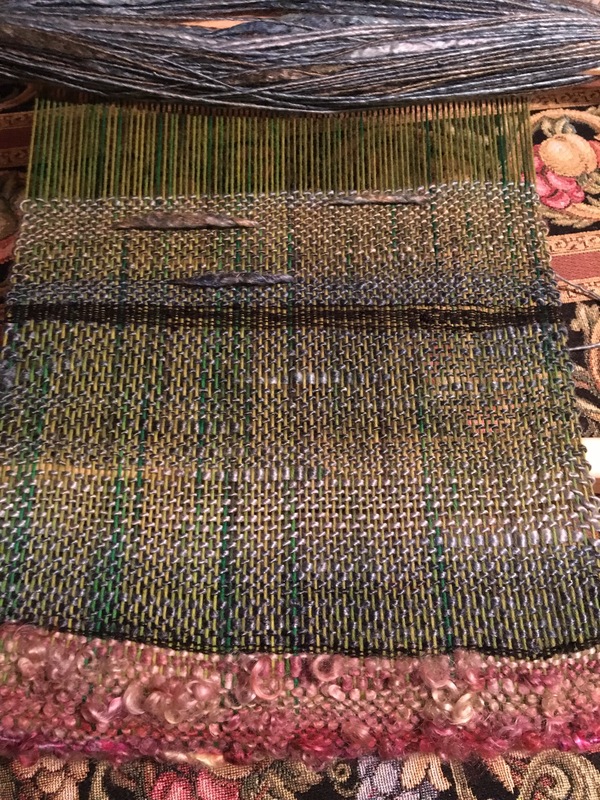 Since the weft was bulky, I warped every other slot. 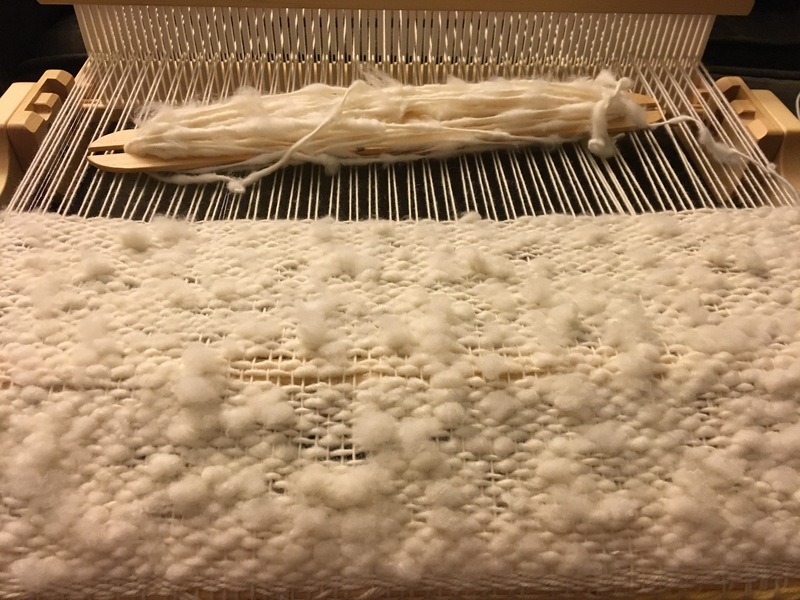 This being only the second attempt weaving, I wasn’t sure how this would work out, but gauge works the same in weaving, as it does with knitting and crochet. I wanted a fabric that was soft and drapey vs something stiff and able to stand upright by itself. I wouldn’t have had enough yarn to warp had I gone every slot, so every other slot worked perfectly. 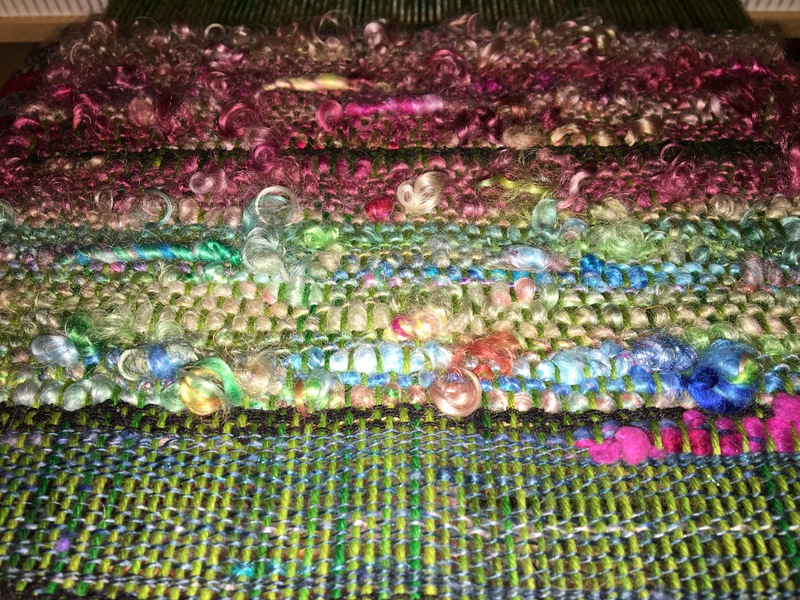 Pulling little puffs of the weft through the warp threads that had my favorite crimpy bits I wanted to show, as I went. Trying to keep things loose, airy, drapey, by not beating too aggressively. The crimp I love was being maintained. The edges stayed relatively even. 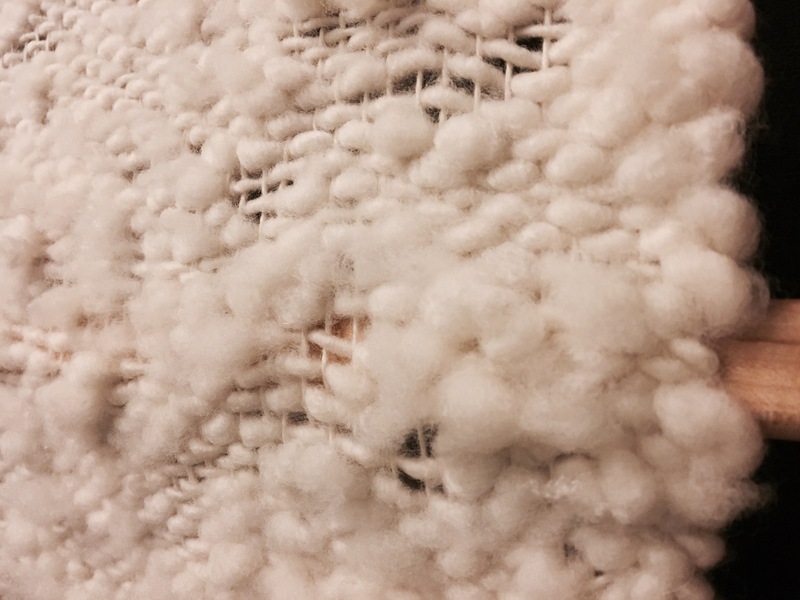 Puffs happened on both sides (front and back) equally. 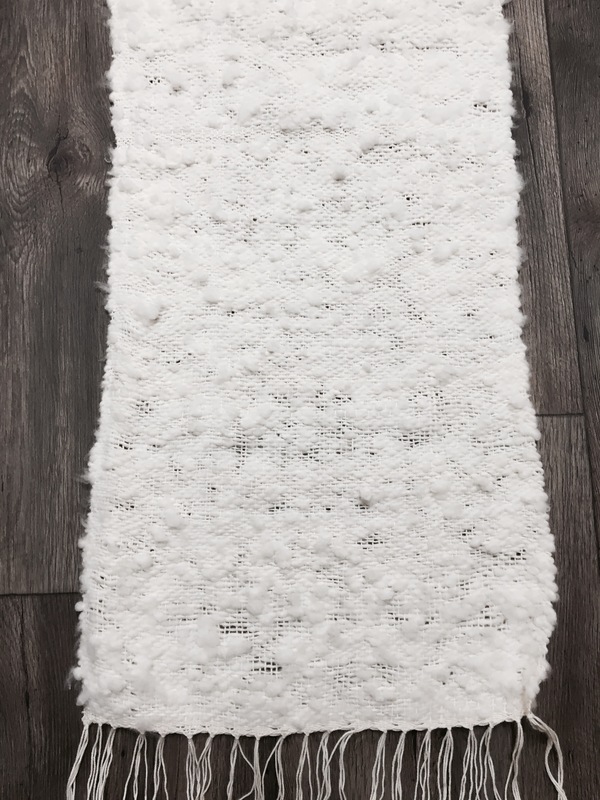 With all the white, the curls and crimpy texture was the fun part of this yarn. I’m surprised I was able to power through and not get bored with all the white. When I look at all the progress photos they all look the same. I can struggle to get through a project that is all the same blah color. I went through the handspun pretty quickly, and would stop weaving to spin a couple more skeins. It is unreal to me how much yarn weaving takes up so quickly. 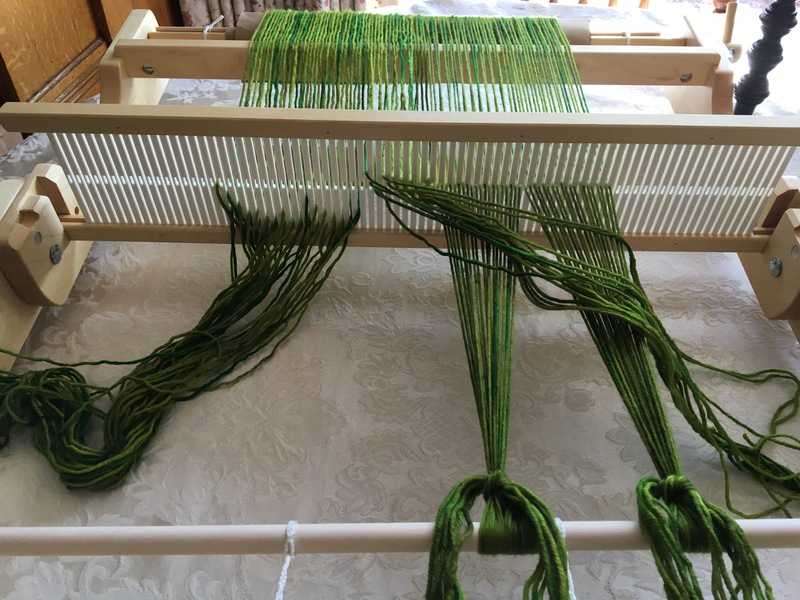 I warped the loom on May 29. This shawl is 2feet by 6ft and used over 10skeins of yarn. This has me thinking about future projects and really needing to be sure that I have enough to get through a project. 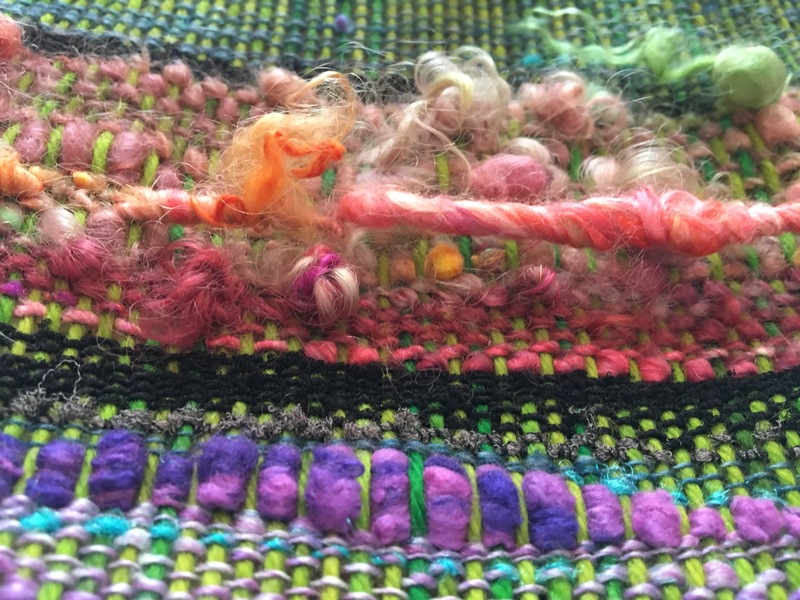 By the end I had started weaving much tighter in comparison to the looseness in the beginning. This is ok by me, as it is able to slide around to even out. But I can’t really tell. My husband pointed it out to me. I tried a “new to me” way to end this project. Instead of a Damascus edge, I used hemstitching. I much prefer hemstitching. This method is much easier for me. It’s easier because it’s still held tightly in place on the loom. Whereas, the other method I tried, it had to be cut first and then tied. As soon as it’s cut its floppy and moving around. I am really interested in all the different ways the ends can be done. I also prefer the way this looks compared to the Damascus edge or the grouped tie off. This gives that little design element for a cute edge. I’m really pleased with how it turned out. It would be pretty cool to have a blanket like this. I just don’t think it would get finished. For my first sheep to shawl I think it turned out really nice. 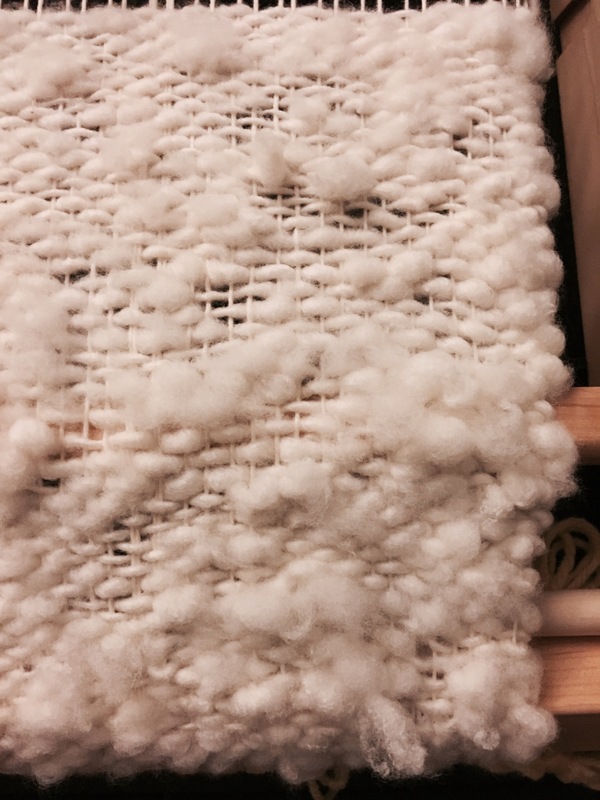 It does feel like an accomplishment to take raw wool and process it, spin it, then weave it. Weaving is so easy and so fast compared to my knitting/crochet it almost feels like I’m cheating. 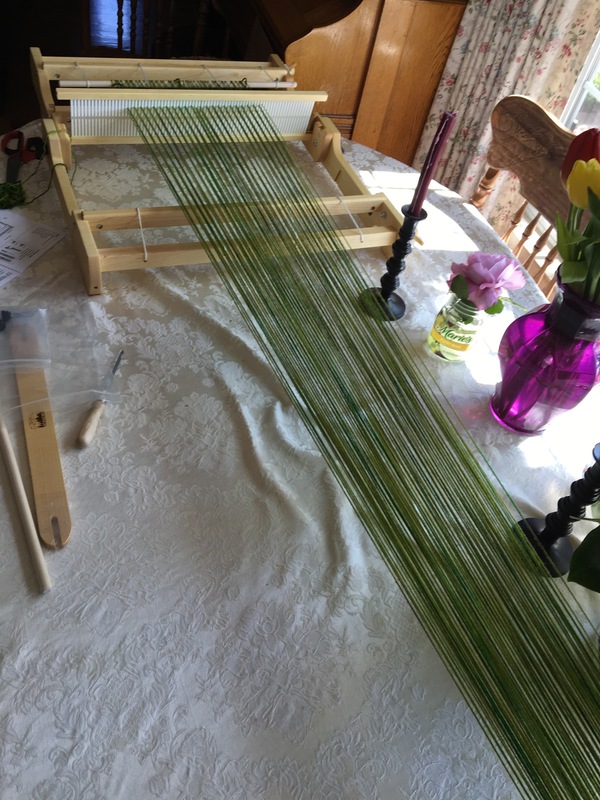 My husband said he really likes the way the loom looks when it’s all warped up with a project on it. I have to agree it looks almost like a musical instrument. It was bound to happen. I mean, this is everything fiber arts, right? 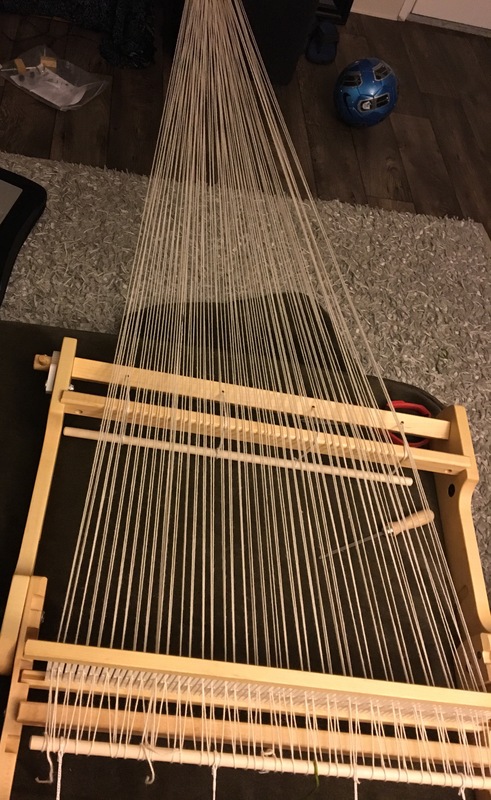 My husband bought me a Schacht Flip loom for my birthday… Wait for it.. I kept putting it off because I had only ever heard how hard warping would be. In the long run, believing this, may have helped. This idea I had built up in my head, of how difficult this was going to be, that when I mustered up the courage to take on the massive job of warping, I was pleasantly surprised with how easy it actually is. I did have some help from the people in Fibery Goodness group on fb. They talked me through any troubles. If you don’t know about them they are a great community. 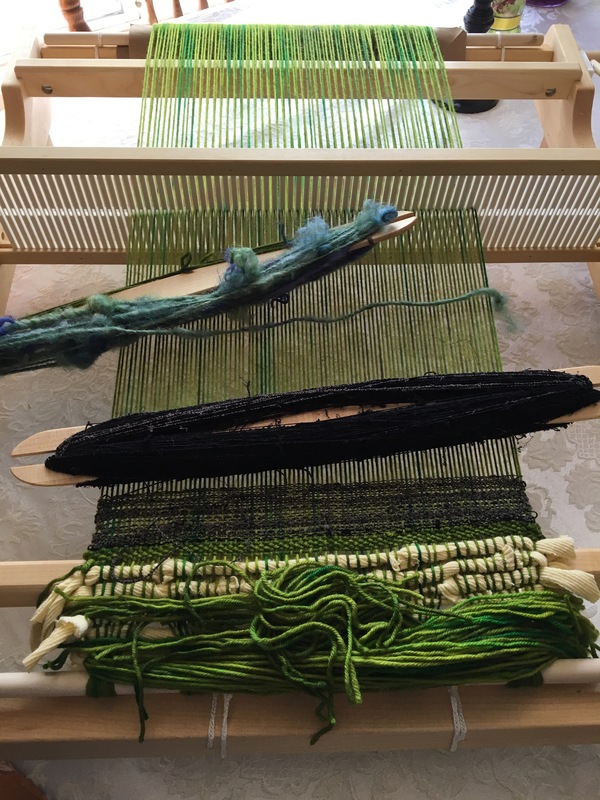 I had never taken a class on weaving. Everything I learned about weaving had come from YouTube. But the questions I still had, I was given answers in the Fibery Goodness group! Such great resource and people and classes in Fibery Goodness. I still don’t know the proper terminology for weaving. But, it is so much easier than I thought. Although, I have a lot to learn. For whatever reason I had these preconceived ideas which I have since learned are not true, for me. I thought I’d share those with you. The following are myths I believed and what I have learned. I followed directions from a video for direct warping with a peg. I’ve learned that warping is really easy. Considering it was a first time, I found it was pretty straight forward. Cutting the string at the end once removing it from the peg, was the tiniest bit nerve wracking, but they were already safe in their slots. The next time I have to make this cut, I won’t think twice about it. The warping process took me 45 minutes to an hour. 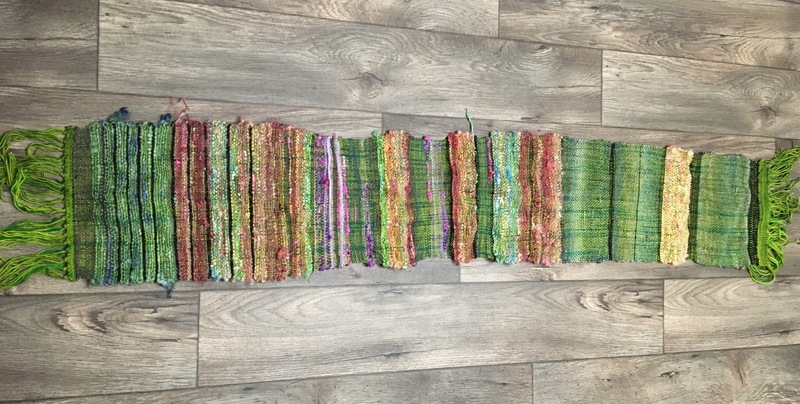 I have been weaving a bit each day for a week and I’m still not halfway. The steps that take the longest are bringing the yarn through each slot to the warping peg, and then when I was finished with the warping peg removing all those loops held by that warping peg, and cutting them. 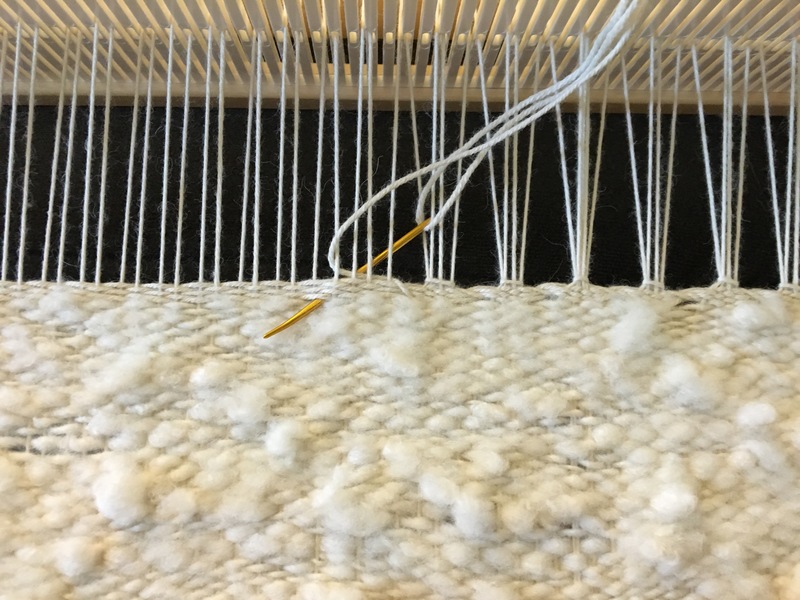 Rolling the warp threads closer to the loom, then taking one of the two pieces of yarn in the slot and hooking it with a special tool through the hole. It’s not fast, it’s not difficult, once you thread the first few holes, you get into a groove. Stick your hook in the hole, grab one thread from the slot next to it, pull it through the hole, NEXT! It becomes a process of doing one after the other and before I knew it I was at my last slot/hole. It doesn’t have to be tight, it has to be even. The second you need to roll it on, you have to release a latch that completely loosens everything, but it will be rolled to the other side and that can make it as tight as you want. That’s why being evenly tensioned is more important than tight. 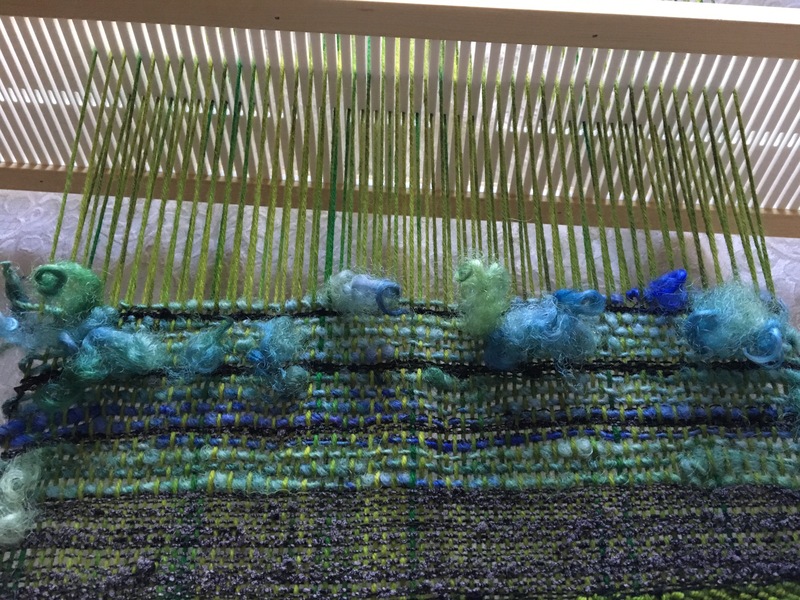 Initially, I kept tightening each group of threads but I realized that tightness can be dealt with by turning the warp beam. It’s making sure it’s even so that when it’s turned it all turns together. 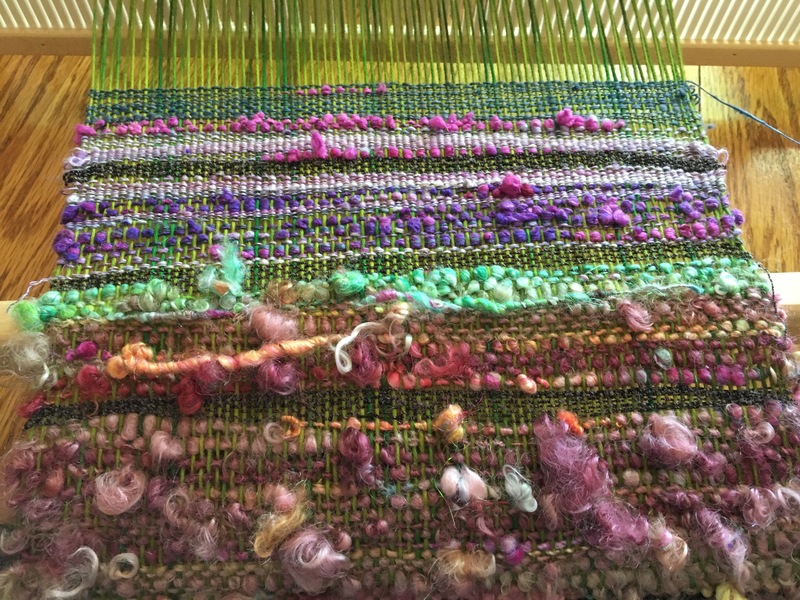 I enjoyed adding the waste yarn because I could see the warp yarn align itself to its proper place with every beat. I’ve seen regular yarn used for this but I wanted something bigger thinking it would be easier to retrieve at the end. People use cardboard strips, or rolled up paper towels, strips of fabric, I used a yarn that I made from cut up cotton tank tops. I thought warping was pretty quick and easy. 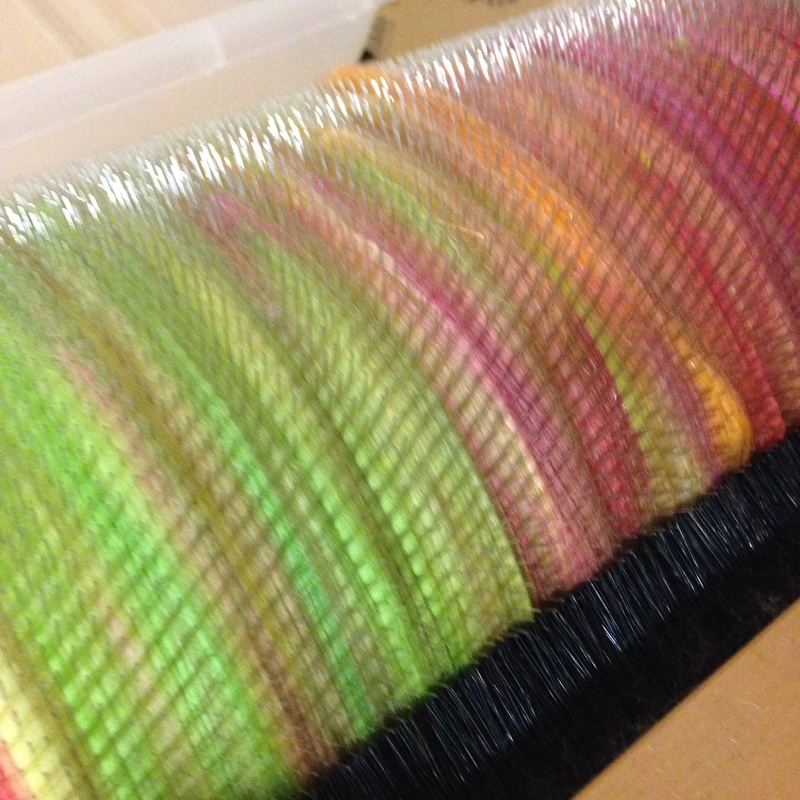 I varied the thickness of my weft threads. Some were lace weight and some was chunky. Obviously, the lace weight goes a lot slower. The above black lace weight weft was only 2 inches of weaving and took longer then the whole warping process. 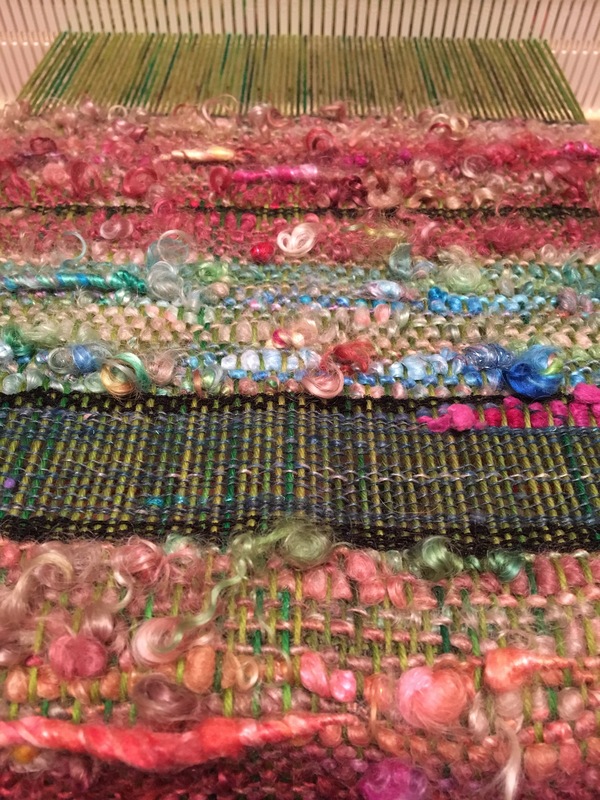 Even when I switched to a thicker weft it still took longer for me. Which I am pleased to have discovered. 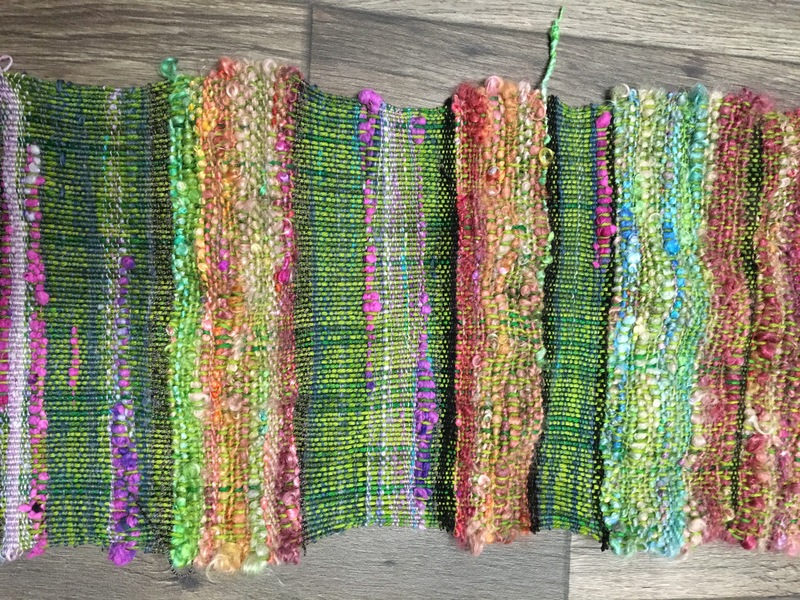 Weaving is definitely the fun part. I got a good week almost two weeks of weaving time everyday. I also discovered how many different colors actually go with green. Weaving allowed me lots of color play that I never experienced with crochet or knitting maybe because it blends the color evenly throughout. Being over and under every thread. Whereas, with knitting or crochet it’s more color blocks. I played with different textures, as well. 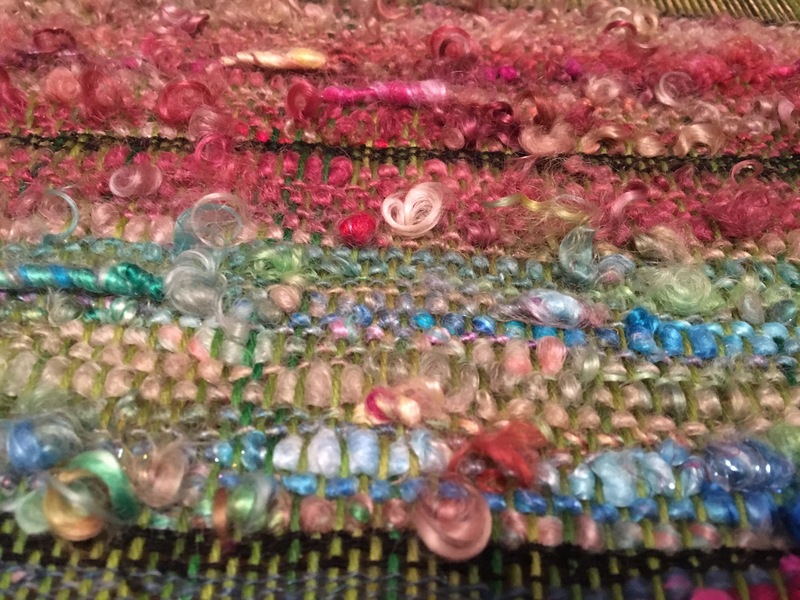 Leaving favorite bits of handspun out of the woven fabric. 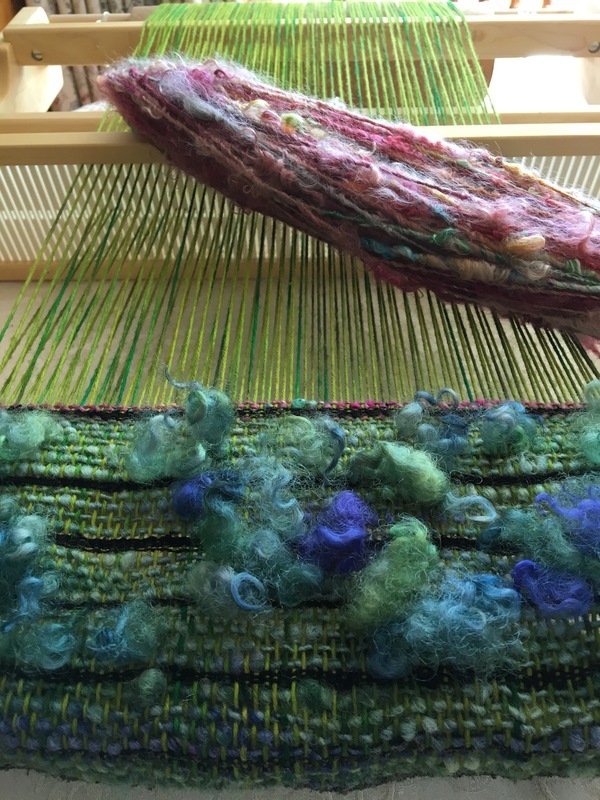 Switching from silk hanky and silk noil, to mohair, to wool and tencel blends. From lockspun, to thick and thin, to a traditionally spun smooth single. It all worked. We have basic spinning that can be learned and art yarns that can be learned. 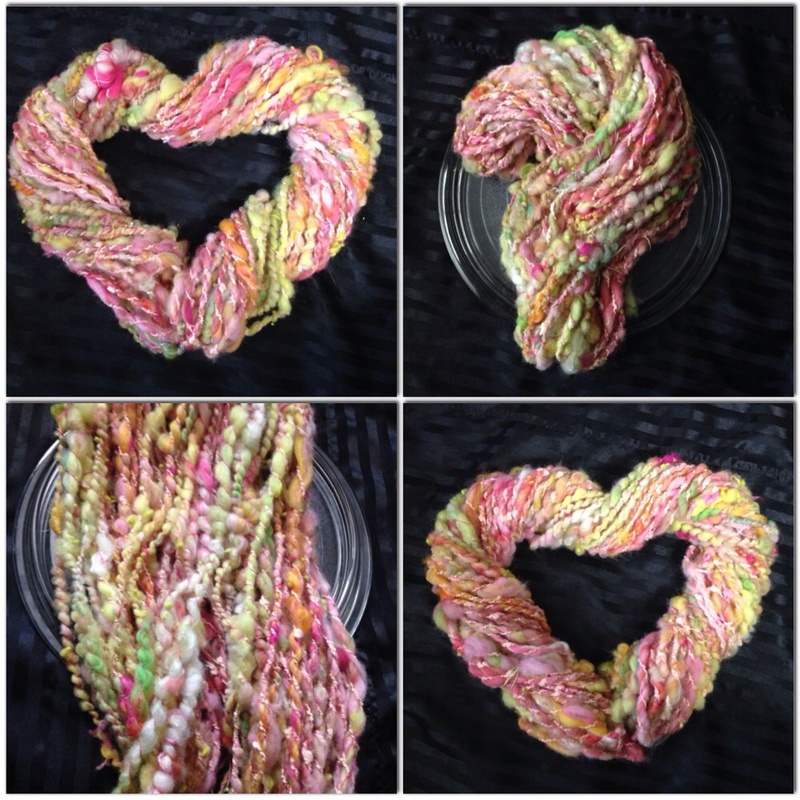 Well this is fun and showcases ways to use art yarns for those special one of a kind woven pieces. So far my knitting and crochet have been pretty vanilla but I want my weaving to be as free as my art yarns. For wearing, for fabric for accent pieces, and wall hangings. I already feel like weaving gives me a kind of freedom. Again this is something I didn’t do much with crochet and knitting. Weaving gave me a new outlet and I didn’t start thinking his way, weaving spoke to me. I felt different when I was weaving m, I felt more free. I did use the same black silk lace weight thread all the way through my project to somehow tie everything in from beginning to end. But I’m not convinced it did. And that’s ok too. Myth-as long as you have even tension and you use that angle before you beat, you will have even edges. Well I really tried to do exactly what was shown in several videos and got nothing close to even. Now to be fair, I haven’t washed it at this point, but the pictures show how my edges go in and out. I don’t know if this is truly a myth yet. I’m ok with my edges for now. 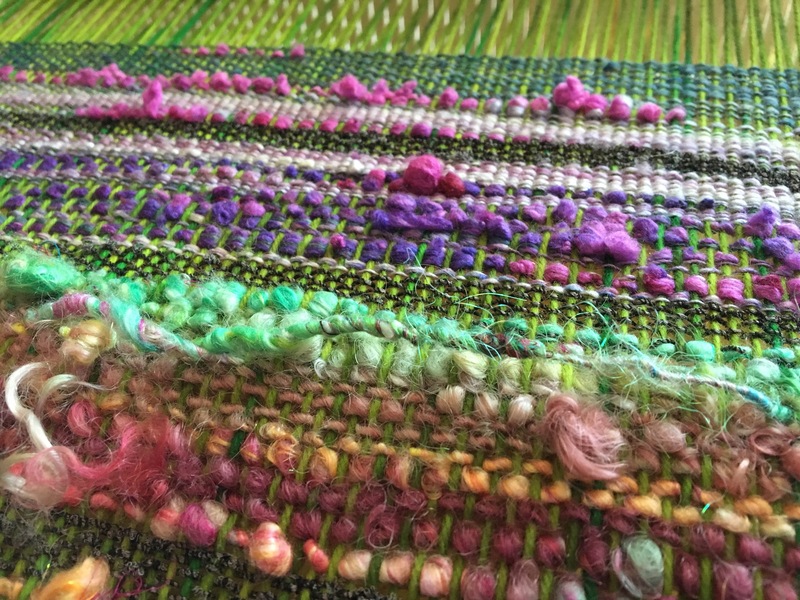 Being a beginner, it’s a weaving right of passage to have wonky edges. I have a feeling, that using thicker yarns, then thinner, then thicker yarns may cause different widths in the fabric and thereby uneven edges. I need to weave more and find out how that works. I’ll learn with each piece if there is any truth to my thinking regarding this. 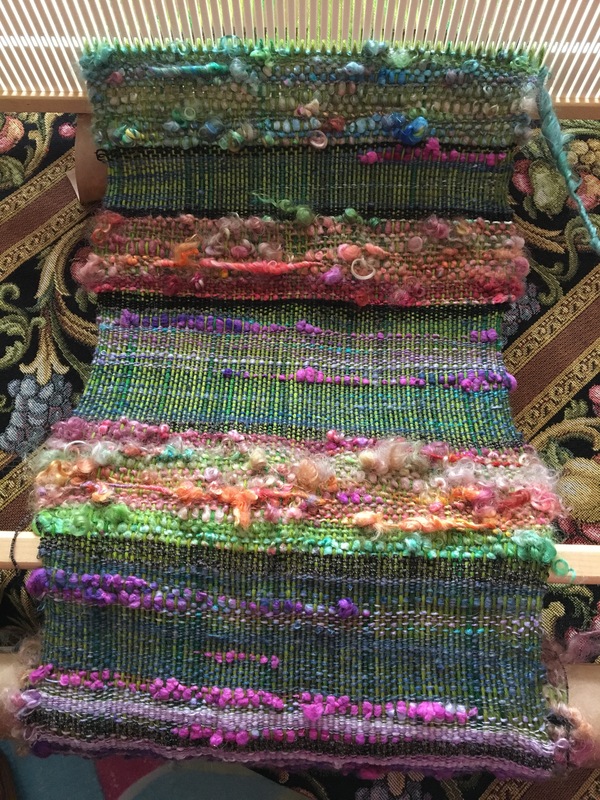 I love the way weaving can showcase yarns! I really had no rhyme or reason to this project. 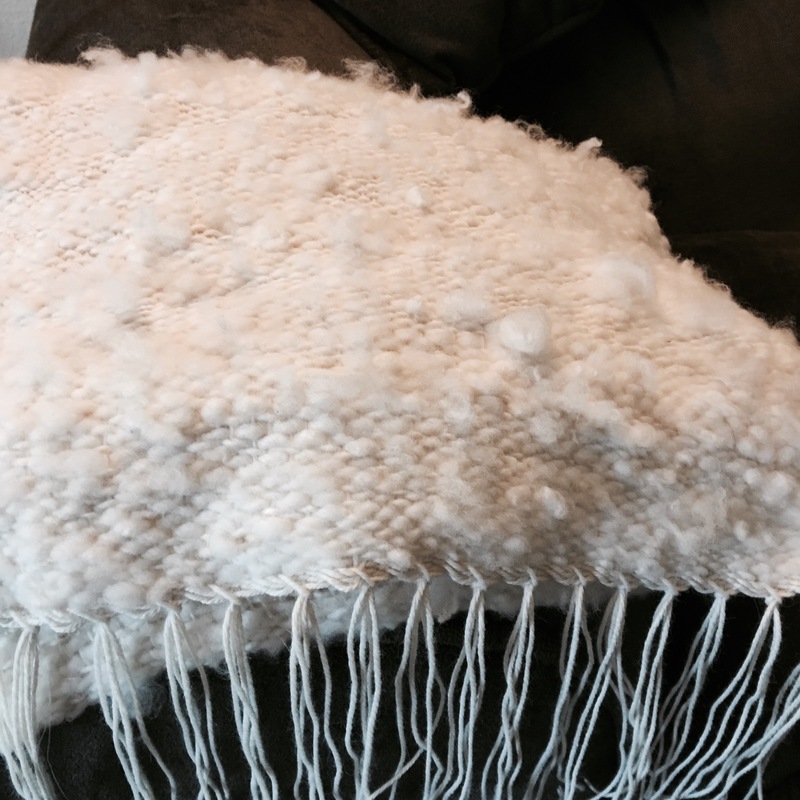 I wanted to weave my first project and experience what it was, to weave. I didn’t worry about perfection. I didn’t worry about anything except carrying that black lace thread in certain places, throughout the project, to tie in the beginning with the end. I found that as soon as the fabric was wound onto the beam and I couldn’t see it, even with pictures, I wasn’t sure what it looked like. I couldn’t remember how thick each section was before I used my black thread again. At the end, I know I was using the black thread less often. Another thing I did, was have any lock tips only poke through one side. So the side facing me is fluffy, and has fluffy, lustrous locks and sweet little lamb tips coming out. On the opposite side it’s smooth. The same is true for any bits left out of the weave. These things only happen on one side. Leaving the other side to look smooth and pretty straight forward. This piece is kind of like a mullet. All business in front and party in the back. As it turns out, one end has more crazy lockspun where the other end has more smooth handspun. If worn as a scarf, depending on which end you have in front or in back, it can look more business or more party. THAT IS NOT A MYTH! This is so awesome for busting through stash. If you have a crap ton of yarn, and crochet and knit as slow as I do, this can overnight make you realize….you just might not be at SABLE, like you may have thought you were!!! I know any one thinking about the possibility they are at SABLE, if you are without a loom, I can’t suggest enough to give it a try. Not to mention many people destash their looms at great prices when they upgrade. Look for those. Some Lys like mine even rent looms out when classes are taught. If you were in the slightest bit interested see what’s available to you. A loom is a gift for you but it’s also a major gift to your stash!! This scarf used 14 skeins of yarn!!! Think about that a scarf! I get to continue spinning, crocheting, knitting, to my hearts content, and weaving took 14 skeins from my stash in under 2 weeks! Next. Project I will take pictures of all the skeins I went through I had no idea how much I would have used!! 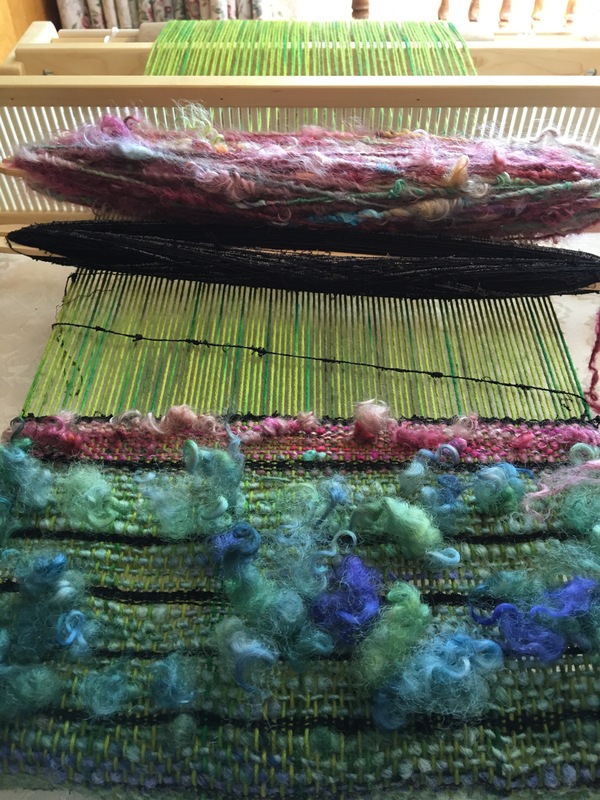 Stash people that don’t have a loom… You may love this. I don’t have the saori, I didn’t make the big investment until I knew I’d enjoy it. For now this works I want to make fun stuff. Ok so… I got to the end of my warp. I cut the edge free and did half of a Damascus edge (just one way across), and tied groupings of warp threads into a sort of fringe. I have yet to wash it. Full it, get it wet, or whatever. It feels rough and looks kind of a mess. I’m hoping for the magic that happens with this step everyone talks about. 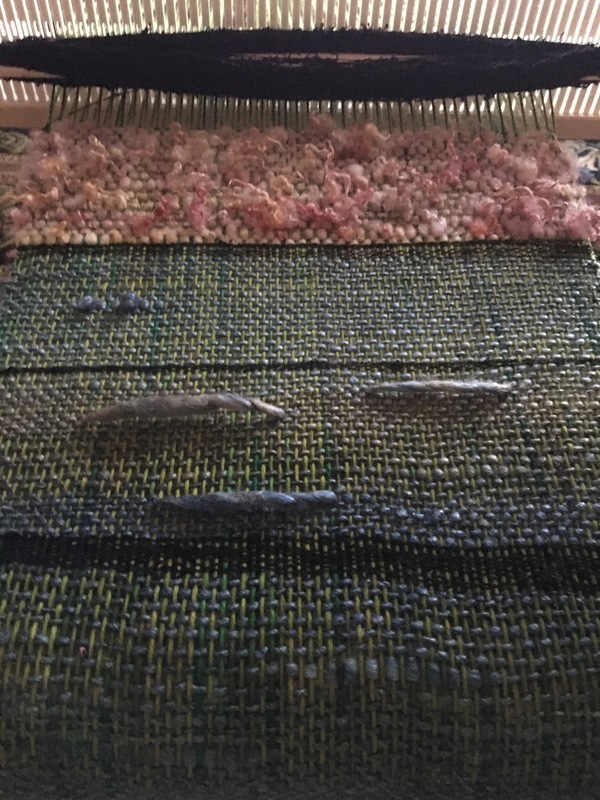 Here is the woven piece before fulling. All in all, weaving is pretty cool and my stash is thankful! And so am I for an awesome birthday gift from my husband! I hope this will encourage people to try weaving. 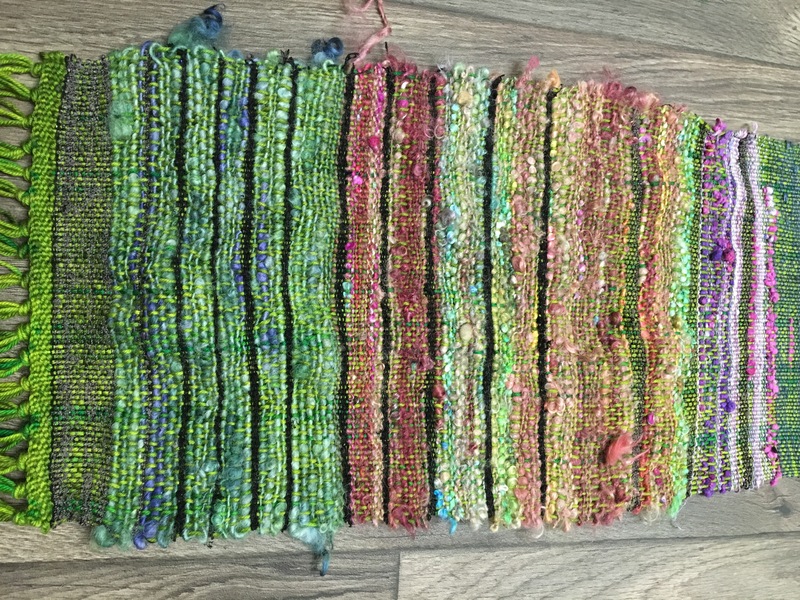 I know my first try at weaving isn’t a masterpiece by any means but have you seen my first handspun ? This was my trying to spin a normal yarn. Those aren’t coils. That is so overspun it won’t straighten at all and it is a hard rock.. If I threw it at someone’s head, they would be concussed. It could cause damage to sheet rock if thrown at a wall. Even weighted after a soak and thwack…. Nothing. It doesn’t straighten out, it’s not usable. 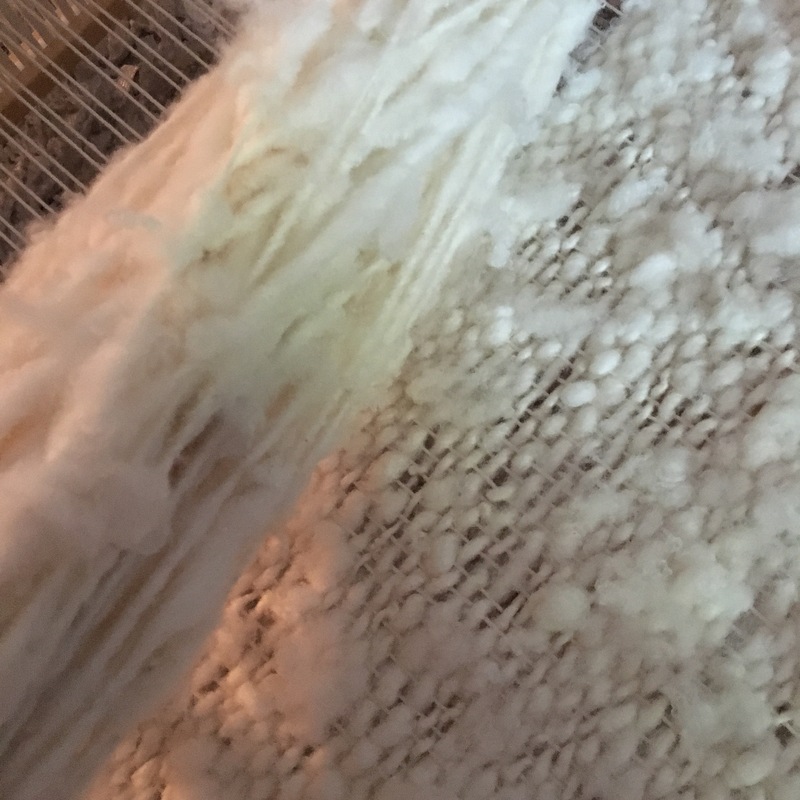 Can you believe that’s just wool? It is wool. It’s hilarious. But I could only improve from there and it’s funny now. I can’t say I’ve ever seen a first handspun quite this bad. Especially when I was hoping for a regular usable yarn. It was a great starting point because I could only go up. I hope the same with weaving and I hope others will join me. Especially new weavers or yes experienced weavers. Fibery goodness has been wonderful and also if you are interested check out the art weaving class I took listed above. I’ll post the woven piece once it’s finished. It needs those finishing touches. Namaste Farms ‘scrapbox’ edition posts will be seen, more than once,in different themes as my collection is growing…. So far, I have Scrapboxes in themes, California Goldrush, Woodstock, Coral Reef, Perfect, Tiffany Renessaince, Shanghai, and more coming…. So, bringin it back to the Namaste Farms Scrapbox in Lily. 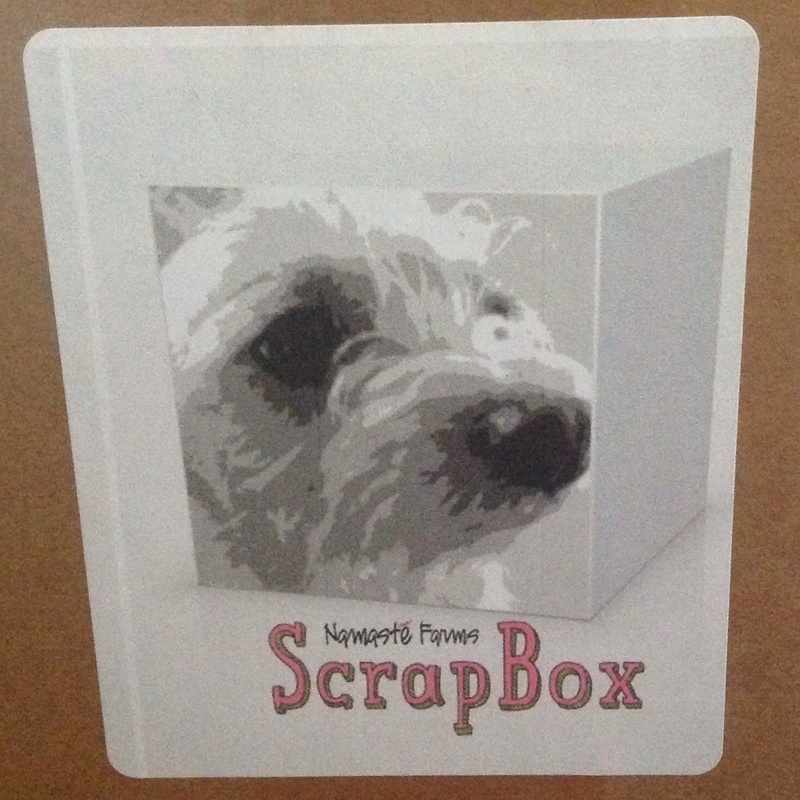 Now, the “Scrapbox” name was actually inspired by, her adorable rescued dog Scrappy, and his cute face is pictured as part of the logo. What comes in these scrapboxes is just that, very generous portions of scraps. A little bit of this and a little bit of that. Each scrapbox has it’s own personality and we get a teaser photo of colors, showing some of what one might find in these boxes. It came with several different fibers, locks, rovings, beads, thread, novelty yarns, nepps, sparkle (both Angelina sparkle and firestar) and more. 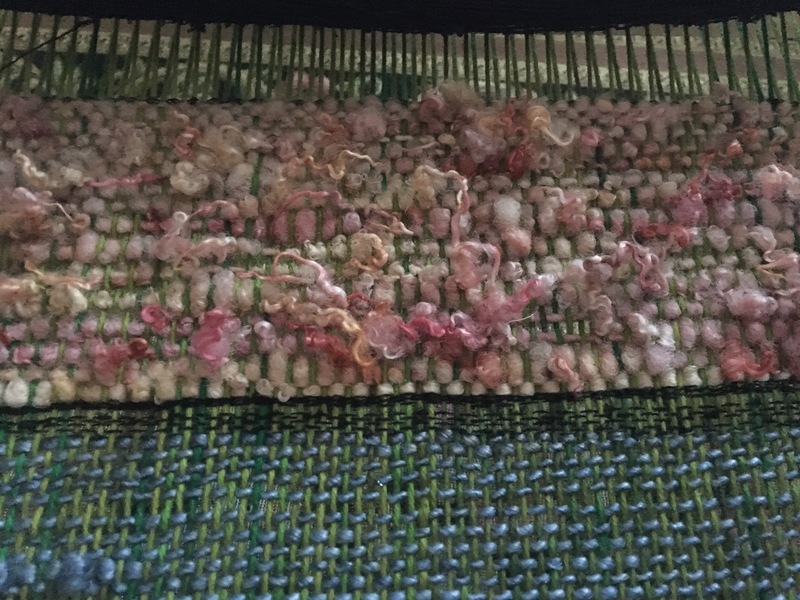 I used everything but the beads and didn’t use all of a pink pencil roving. Each box has different fibers, different add ins, and tons of inspiration. These scrapboxes are like being given your cool friends stash for one hell of a deal. Because, in fact… They are being made from Namaste Farm, (Natalies) stash, which includes, the late, brilliant, Janice Rosemas, stash. Both ladies, made high end yarns for personal use and sale. I love other people’s stash, hee hee, and the stash that’s being shared here, is exceptional, and special. Truly, I have lots and lots of stash, no shame here, I love my stash, and I won’t apologize for any wool piggery, should I be accused. Having recently moved, my cleverly stashed away stash and it’s abundant size was more clearly revealed to me. It was contained and had a place, but I will say I hauled a lot of wool to the new pad. When it comes to the scrapbox, it’s not like buying a braid or a batt. Though a scrapbox may contain scraps of each of those. I cant really list what is in each scrapbox as, it’s never the same, and feels more like a surprise, almost as if one was in a club. Opening the box, is sooooo fun. Everytime I get a new one, it’s like my birthday… Sure, I know the color theme I ordered, but what else comes, are extra surprises and plenty new to me, things to try. If I collected each of these items in just one box separately…. I’d easily be a few hundred $$ in, and the boxes allow one, such as myself, to sample a hefty skein amount of different items. Scrapboxes currently seem to run in the $30-$40 range generally, this includes shipping in United States. Shipping to Canada is an extra fee. 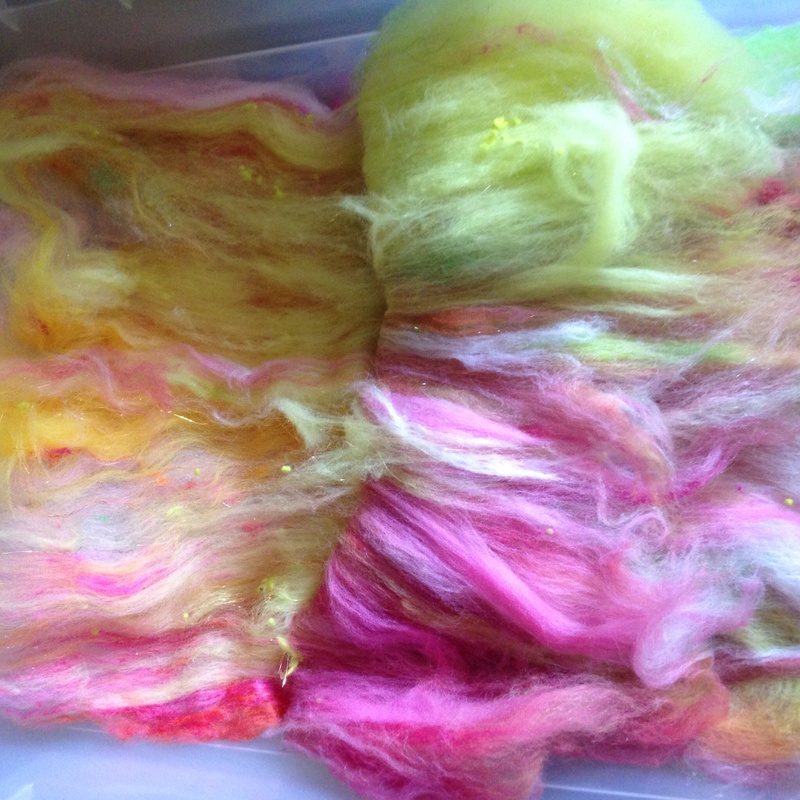 I did purchase one in the $40 range(California Goldrush), that box had high end fibers, like cashmere, angora bunny, etc and addins like vintage beads and gold. Yes, real gold. 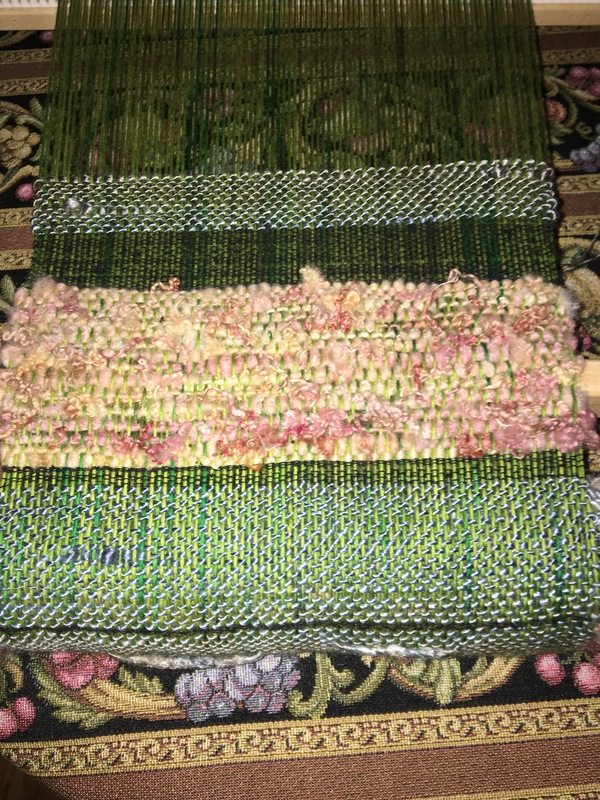 Which, I never would have even thought to try, but gold leaf actually sticks to the fiber and just meshes in, wrapping around fibers perfectly….. Ok I’m getting off track, that’s another box for another handspun adventure… It just amazes me how creative people are when it comes to handspun! Ok, Back to talking the water lily scrapbox. Seeing what others are doing with their scrapboxes and fibers have inspired me. I’m getting more fun out of spinning artisan yarns. At the very least I wanted a fun, fluffy spin. Because the fibers are dyed and ready to go, I decided to card them together, in a way so that it might create color stripes. The lily scrapbox color theme had lots of color. 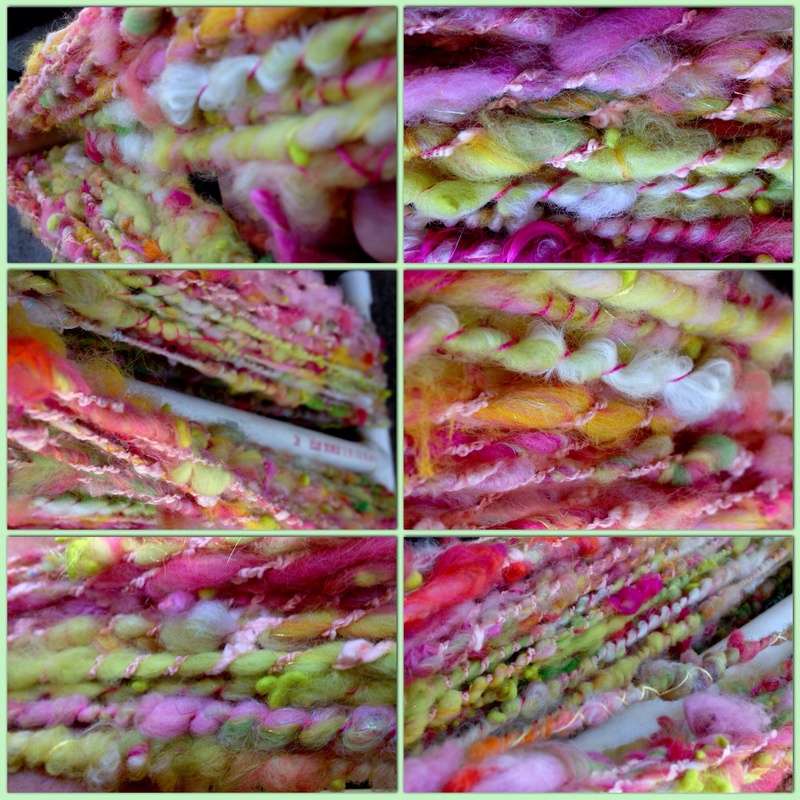 Different shades of pink, peaches, oranges, whites, deep golden rods to bright yellows,water lily pad leaf greens, a lighter pink novelty yarn, dark pink thread, pieces of a pink handspun made of something silky, different types and colors of sparkle that matched the wool. 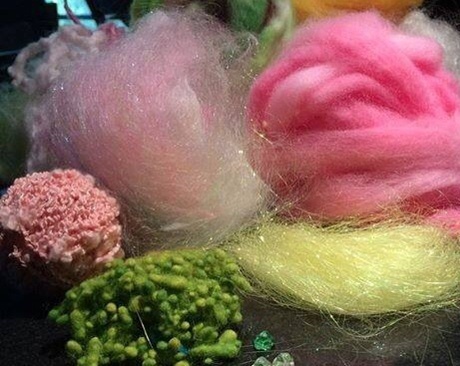 I honestly could not say all the varieties of fiber included in the box, as there were many different types, some softer than others, some pencil roving, some lock form, some fine wools, medium and luster wools. There were beads that I decided not to use this time, and I added in with the Tiffany scrapbox to use later. 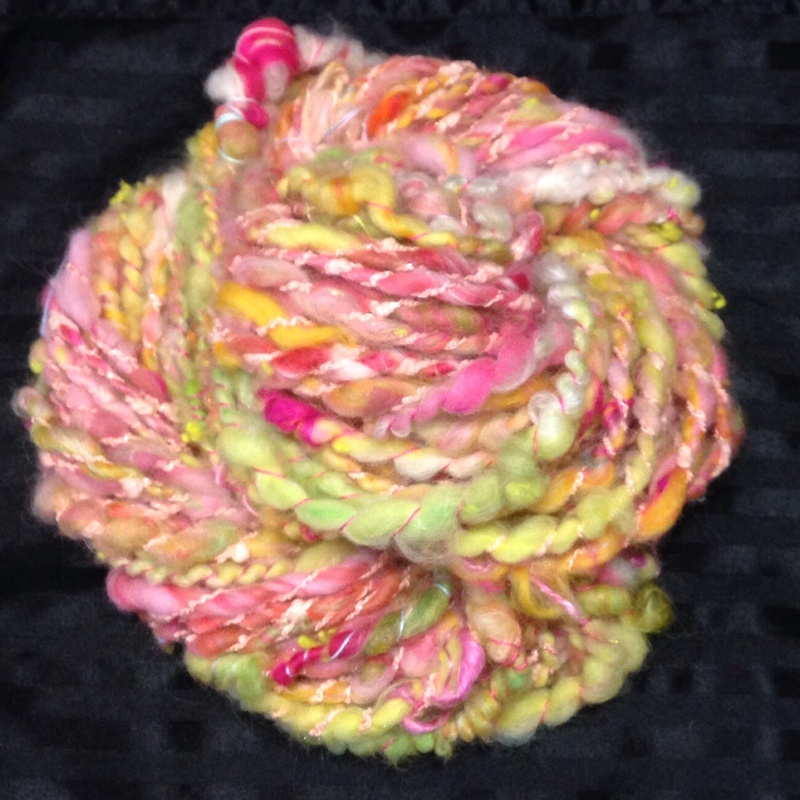 With lily, I decided to make a batt, and then turn that into a roving with most of the fiber. Each color in its special place, sparkles, nepps, Angelina, silks…. Etc I made specialty fiber addin in woolsandwiches, lastly, I painted on the carder with the locks to keep the curl, straight to the large drum, instead of at the licker in drum. Once that was finished, I took the batt off, the outside was beautiful, I peeled back a layer and inside it hid more treats of color for me. 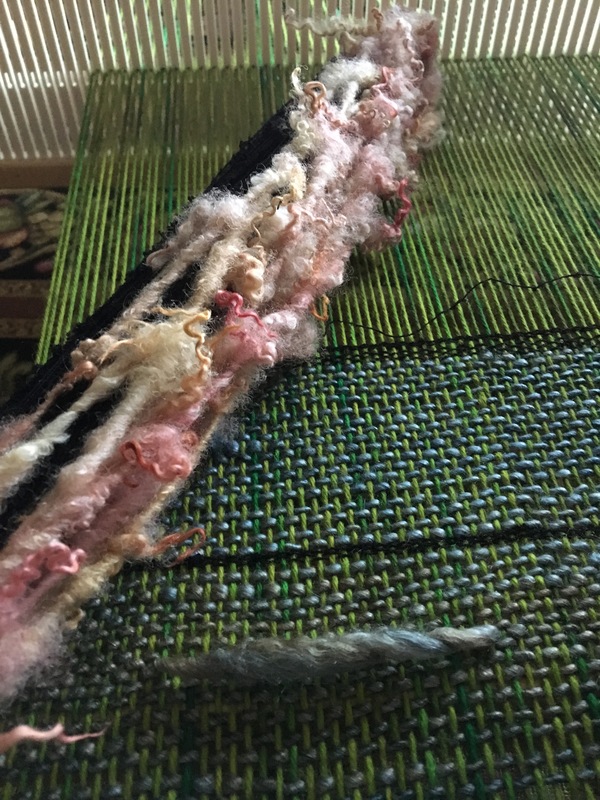 I decided to strip the batt, just started at the top and split straight down, then gently drafted the batt strip into a roving exposing what the batt was hiding inside. Once finished drafting my strip,I rolled it into tidy nests, ready to spin. 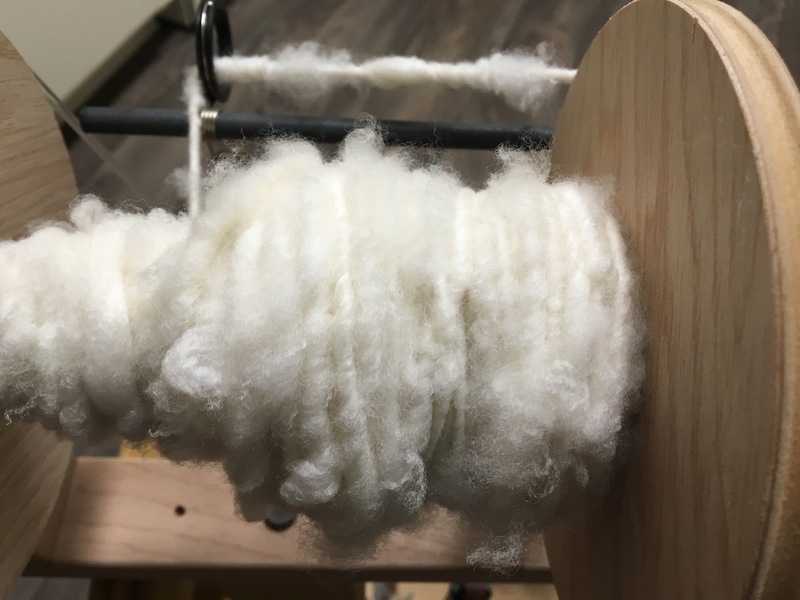 I used my Matchless spinning wheel, with the jumbo head and bobbin, to allow for more fluff to pass through the orifice. I tried a new to me method, pulling fiber left and right, keeping my best to stay at a 90° angle (aka, coreless core spinning). In the very beginning, I was slow with my hands and quick with my feet, overspinning, getting some unwanted kinks. 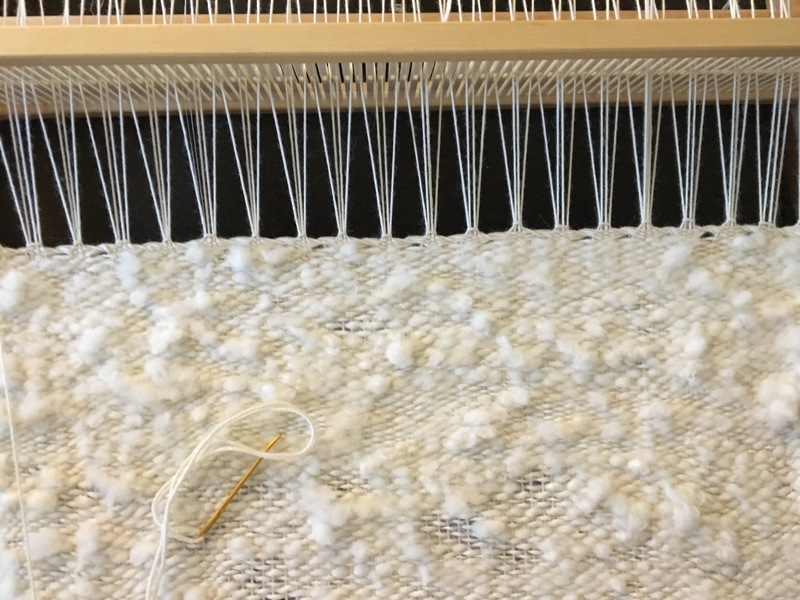 I slowed my treadling, made some adjustments, and settled into the motions my hands were making. This was my first ever try spinning nepps. These little felted wool balls, like cupcake sprinkles, except for a fibery treat, to my surprise… didn’t always stick. Some of them actually shot out like bee bees. As I spun, nepps, softly shot at my pups napping beside me…I didn’t expect that, and neither did they. After a few misfired nepps, the dogs got up to lay, safely, elsewhere hee hee. As far as the nepps go, when they do stay in, they look really neat, especially, the nepps being in a different color then I was currently spinning. Nepps are going to take me some practice getting use to, but fun nonetheless. 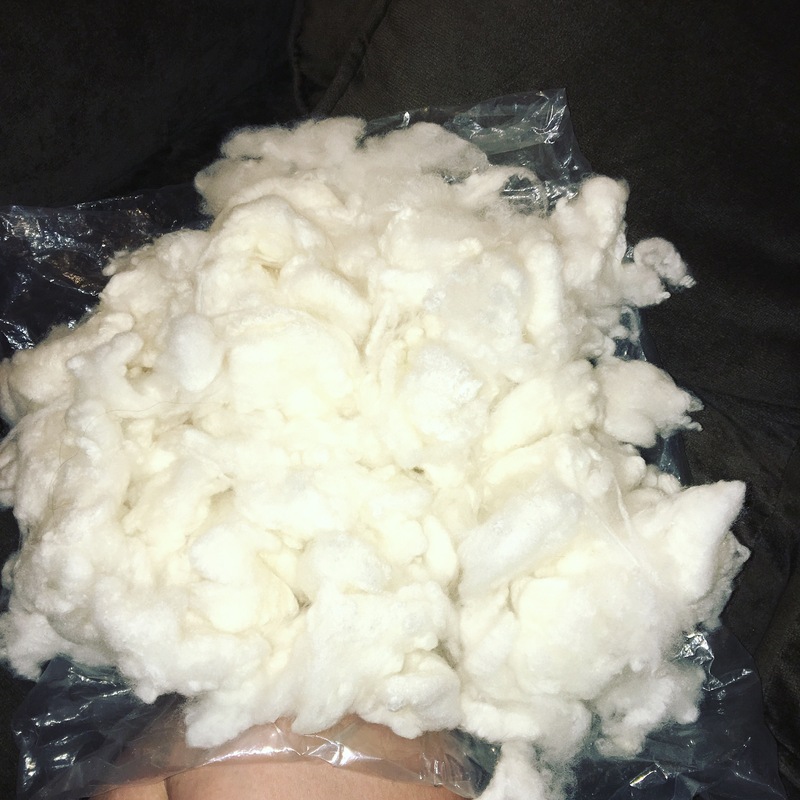 I wonder if my homemade nepps will be different since they aren’t yet the hard wool balls, but rather, the tiny soft curls. Once plying, I started with the novelty yarn, wound in the ball. It literally had texture, that looked like a brain to me. That one ball of brain yarn was in the teaser photo for this scrapbox, as seen above, and I had to have it. Come on, brain yarn, everyone?! You have to understand my intrigue. Once the brain yarn did it’s job, I switched to, the bright dark pink thread. Which landed in lighter parts of the single I was plying, making it really pop. I love thread plying. I love the way it looks, the way it makes the other single look more puffy, and how it can stack next to each other making a faux bead, plying with thread gives handspun a completely different look, that I love. I switched next, to another thread, that was pastels in pink blue and green, all the colors in my scrapbox. Until I reached the end of my plying. They would see, mostly two or three ply yarns, that I’ve tried my hardest to be consistent WPI. The whole artisan yarn, tailspun, lock spun, add ins, has always intrigued me, and in fact what started my spinning to begin with. Seeing yarns that were, more than yarn, it was art! Just gorgeous and fun and showed off the fiber. I wanted to do that. Learning to spin these years, handspun is an art form itself, and I have so much still to learn and experiment and try. I do consider myself a spinner, a real spinner, and a good spinner at that. Spinning a yarn like this… is very new to me and I am loving it. I still love my regular (more commercial looking)handspun. It’s easy for me to make now or more natural. It’s relaxing, I can do it without thinking. But I needed to try the luster packed locks, those beautiful curls that flow exactly the way they do on the animal. Exactly, like they do on the dancing rock star, sporting some fringe! considering I’m on a new wheel, my matchless with the jumbo bobbin, and new mediums from nepps to gold to true long, and I mean long, teeswater locks, I’m giving myself a little break from the perfection I’d strived for making yarn those first years. 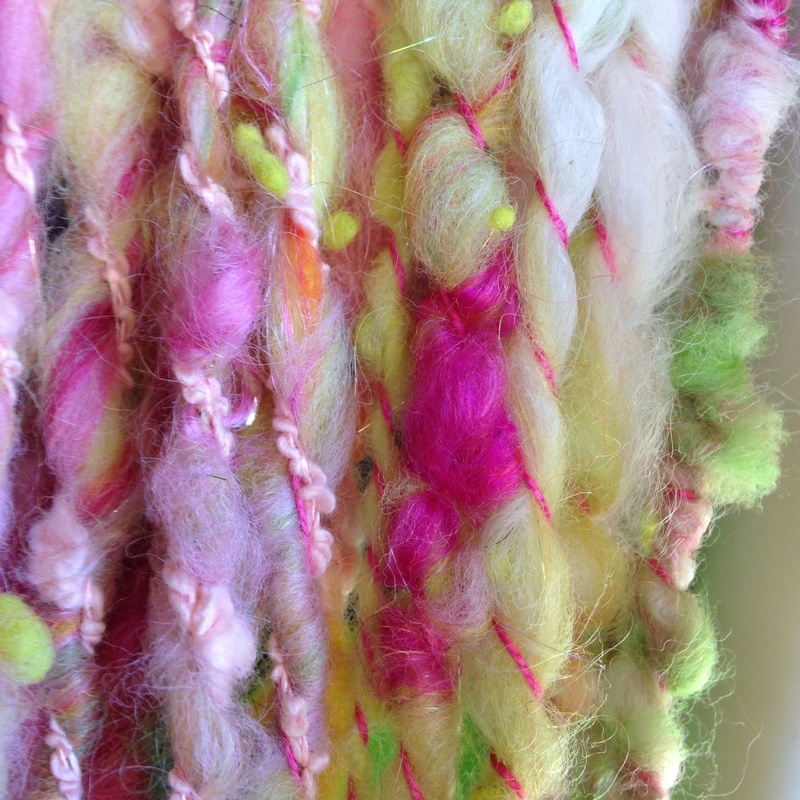 Truth be told, my first ever handspun, looked like art yarn only because it was so overspun, it coiled onto itself and even soaking, thwacking and weighting it while drying did NOTHING TO HELP STRAIGHTEN IT. I’m not sure I’ll ever use it, mainly due to how good it feels to see how far I’ve come. 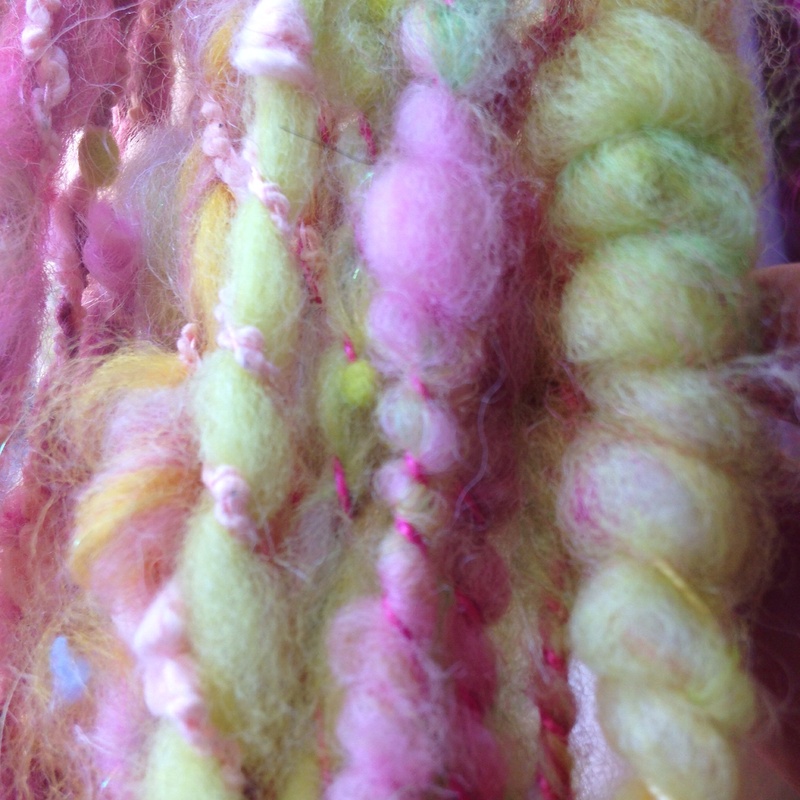 I always compare my handspun to others, I love other peoples handspun, no two the same. Some, simple, and new, some with purpose for a project, while others just spin with nothing in mind but letting the fiber decide what it’s going to do, some better then others, as it’s just intuitive, while others have to really work at it. 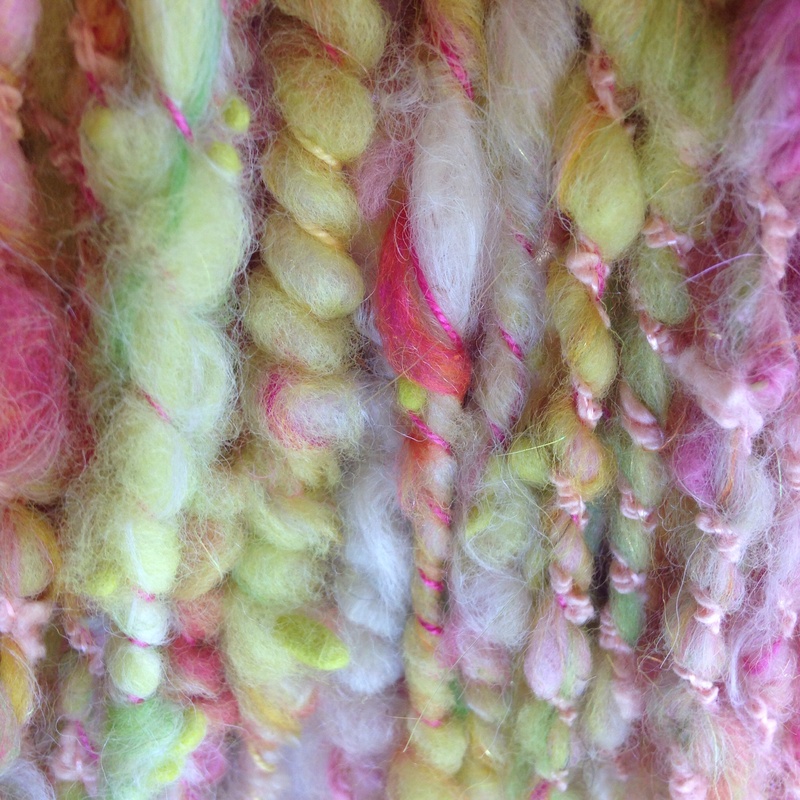 I consider handspun to be a true art. Much easier to make with excellent fiber, but it’s all awesome. 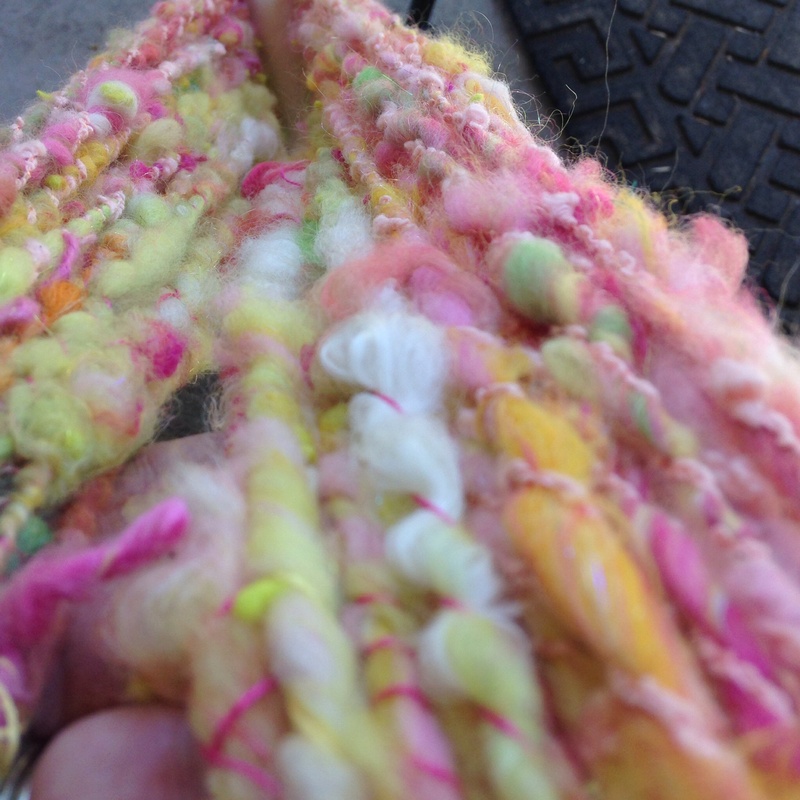 I decided to let my finished yarn rest on the bobbin for a day, and when I took it off….. I must say I was pretty dang pleased with myself. 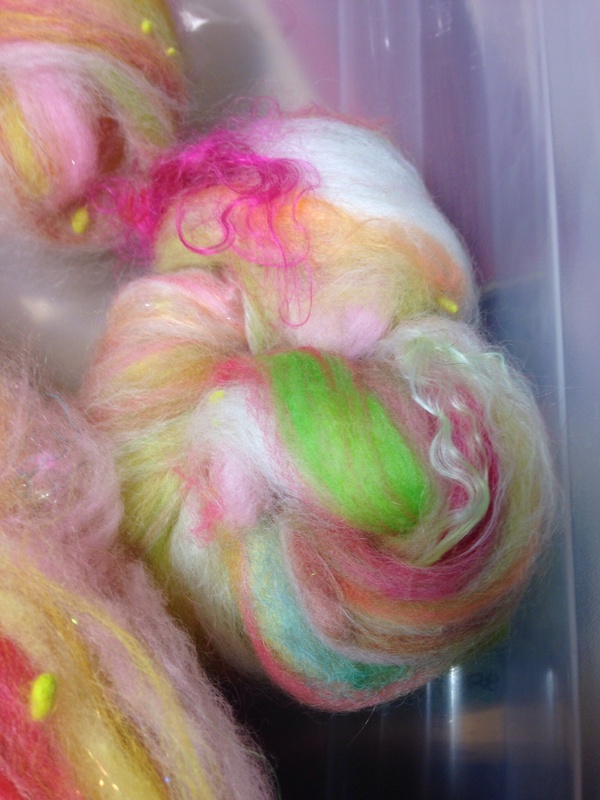 It was well balanced, it was light, airy, fluffy, and I can’t wait to spin the next scrapbox. It’s so hard to choose what comes next, since I have a feeling that with each spin I’ll get better and I want to save the special favs for the last. The other problem with that is…. Each scrapbox is a favorite. I’m also right in the middle of a major move, guess what was the last thing packed, and the first unpacked… Of course, my fibery goodness, how else is one to keep there sanity. If you do get a chance, I highly highly recommend picking your favorite color and making the purchase if you haven’t already. A little about why you see so much of namaste farms…? She knows good fiber, she doesn’t mess around with anything that is going to cause frustration, like excessive vegetable matter, felting (that wasn’t meant to be felting)cotting, she is honest to a fault, about her wares and she stands behind her product. If it doesn’t meet her standards, she refuses to sell it, taking the loss. She sets the bar high when it comes to fiber. There is a reason she sells out so quickly and has such a following who love her fiber!! I have several other favorites, you will hear of them too.